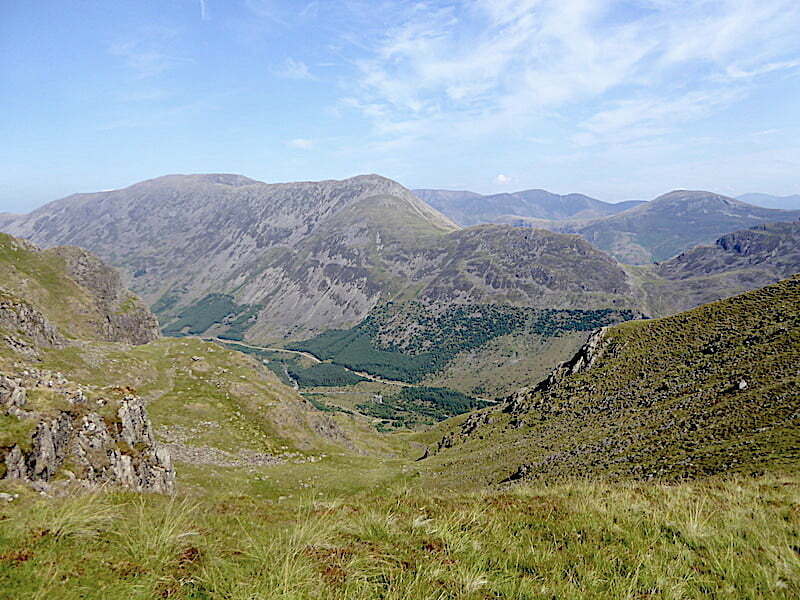 What AW omitted to mention was the climb out of Ennerdale up to the Black Sail Pass, so we have three steepish climbs ahead of us, Gatesgarth to Scarth Gap, Ennerdale to Black Sail Pass and Black Sail Pass to Pillar, three good enough reasons to start out early. It remained to be seen as to whether we fitted into the ‘strong walkers’ category. 7.38 am as we cross from Gatesgarth Farm to Peggy’s Bridge. The morning is still relatively cool and there’s a very refreshing light breeze drifting around us. There is no-one around as we make our way across the track towards the bridge and the morning sun is lighting up Haystacks and Seat very nicely. 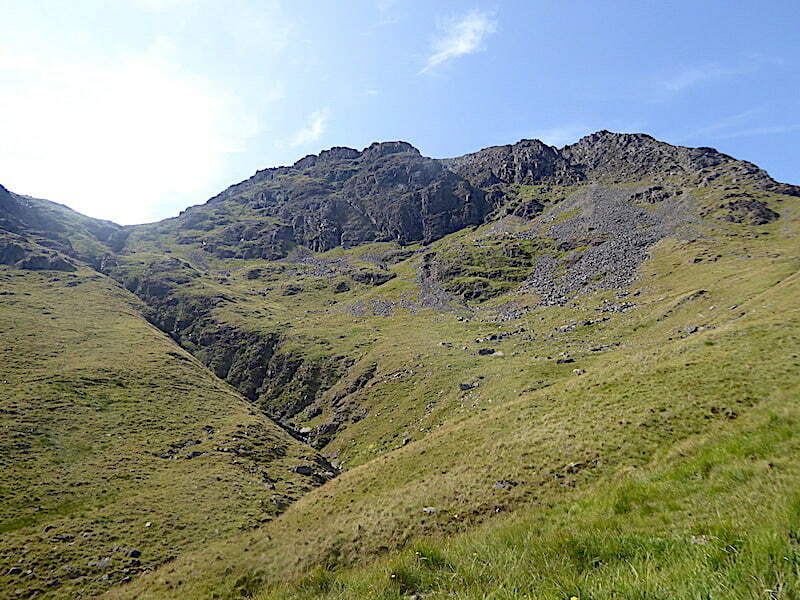 The little col between the two is Scarth Gap which will mark the end of our first section of climbing. 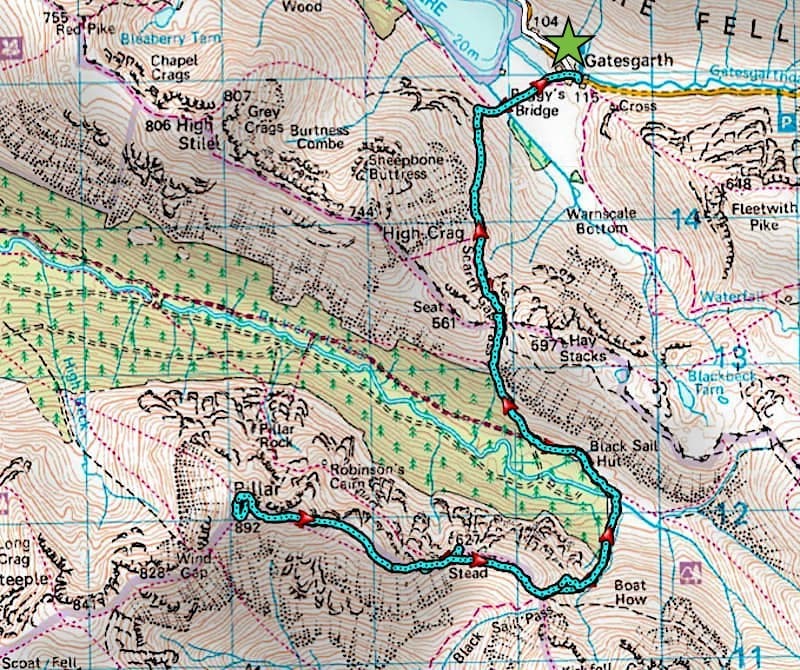 Our plan is to break down today’s route into bite-sized chunks rather than approaching it as a psychologically overwhelming whole. 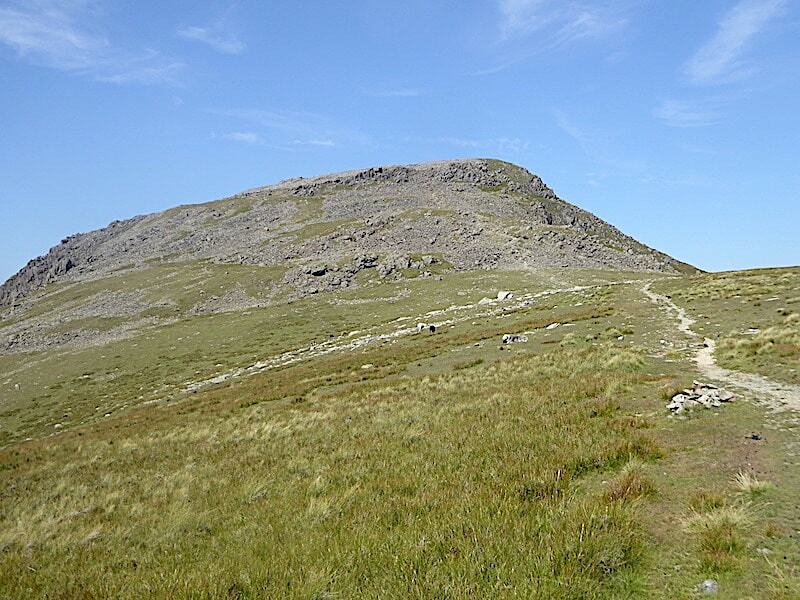 That method works best for us, so for now we simply concentrate on getting up to Scarth Gap. From the track to Peggy’s Bridge a grand view of High Crag and High Stile towering above Buttermere. 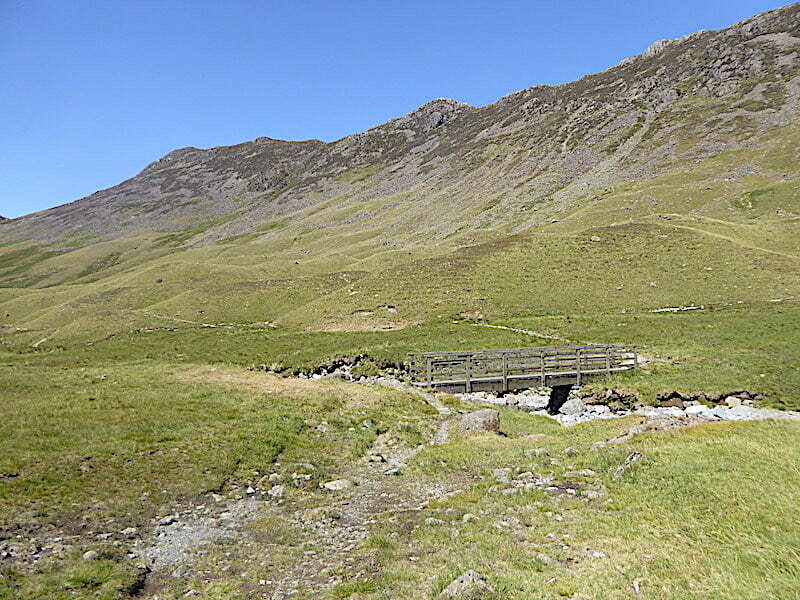 Once across the bridge we will follow the path rising alongside the trees, turn left at the end of the tree line and continue on the path across the fellside over to Scarth Gap. Warnscale Beck flowing down into Buttermere as we cross Peggy’s Bridge, and the last piece of flat ground we’ll stand on for a while from here on. 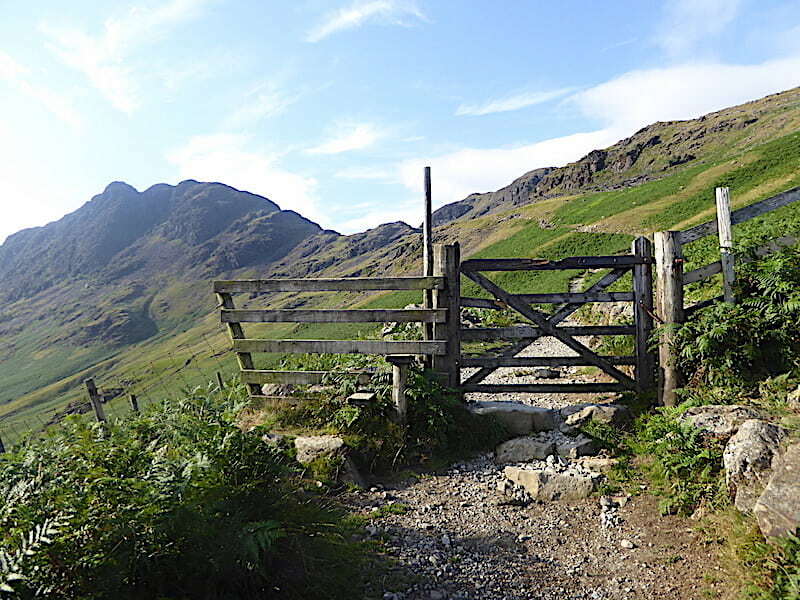 The path snakes its way across the fellside where the rickety old gate is just about on its last legs. A look back at our route so far. Gatesgarth Farm is to the right of the shot with Robinson rising directly behind it. 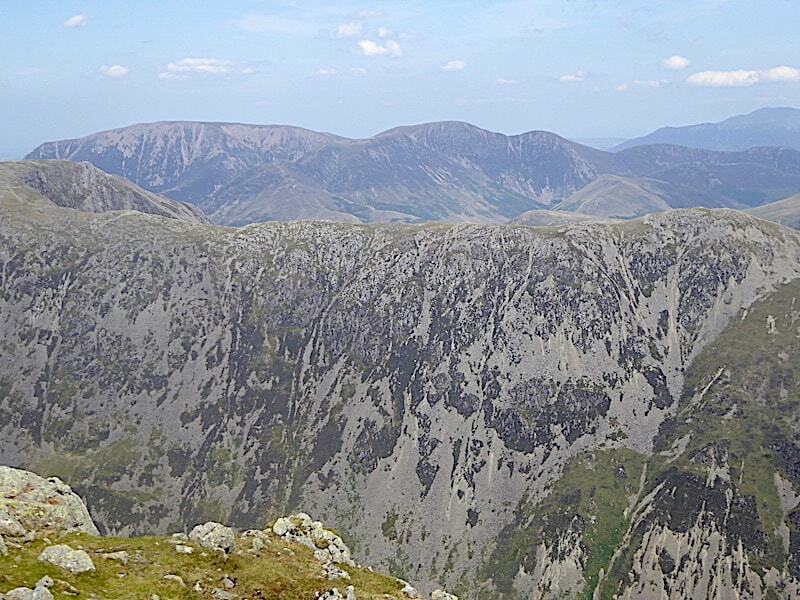 Grasmoor and its Lad Hows ridge is over on the left of the skyline. The breeze is just a little stronger up here and that’s keeping us very comfortable. I’ve remembered to pack my face mopping towel today but so far I haven’t needed to use it, the breeze must be evaporating the moisture from our faces. 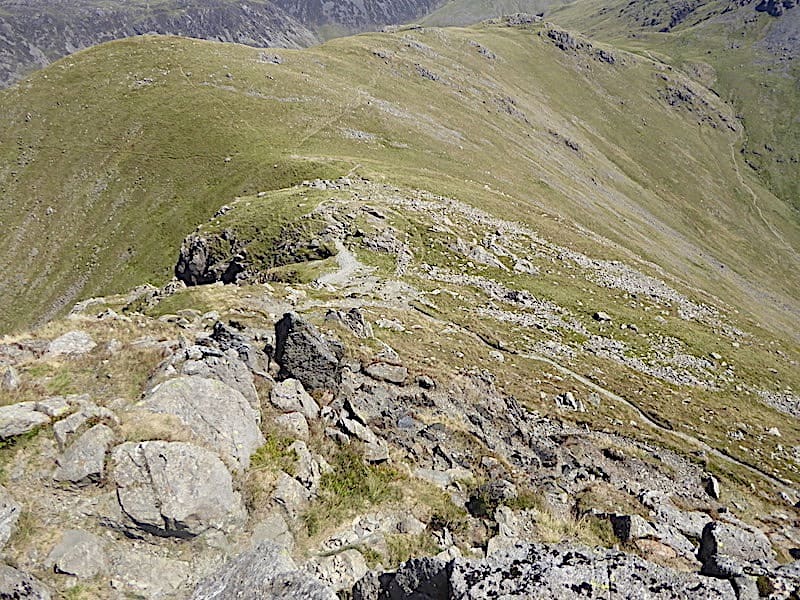 Below High Crag where the path begins to turn up to Scarth Gap, it also gets a little wider, more boulder strewn and much rougher underfoot. J takes it steadily, his pinned and plated ankle doesn’t enjoy walking over very uneven ground. 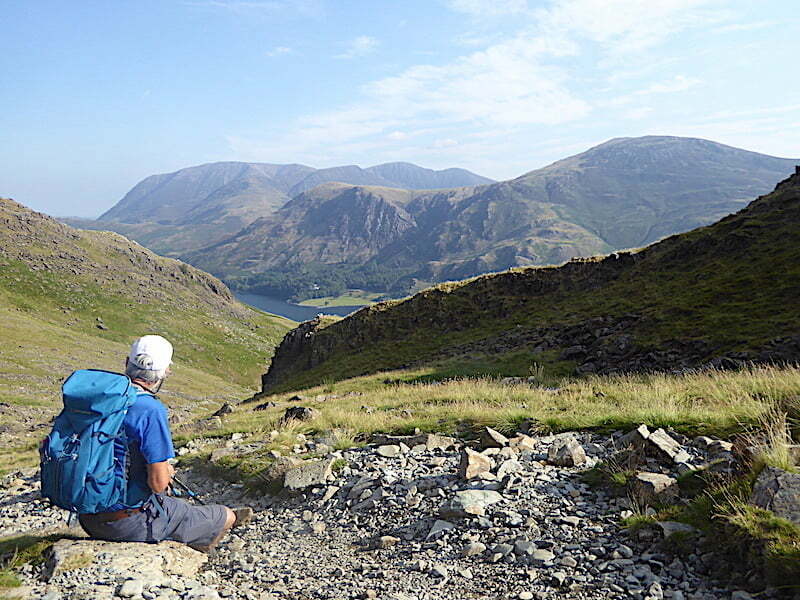 A couple of the boulders come in handy as we take a short break for a drinks stop and a look back across Buttermere at the Grasmoor group and Robinson. A rocky outcrop a little higher up provides a much better view and we have a few moments of relief from the sun as a thin bank of cloud drifts across it. We continue on up the ever steepening path, which we lose now and again when it disappears across a few particularly rocky areas. 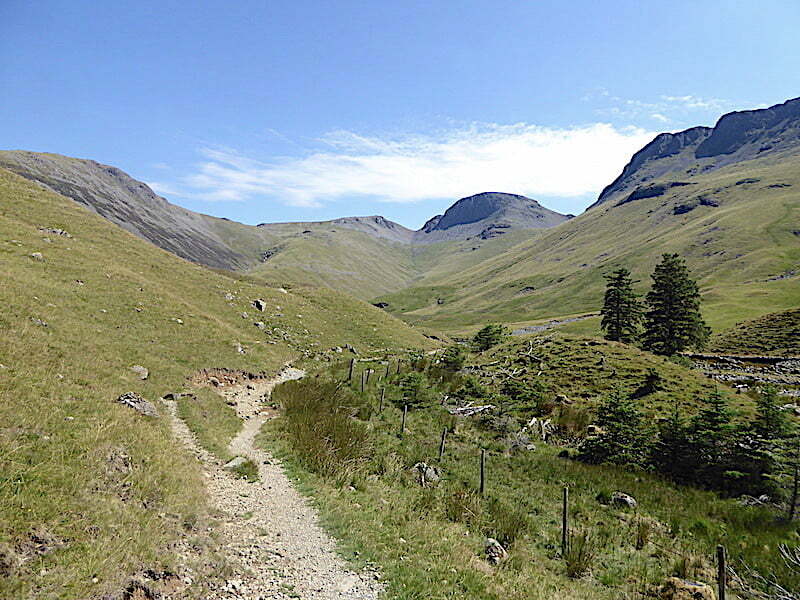 Some stone pitching has taken place here and there but for the majority of the way up to Scarth Gap the path is rough and very loose in some places. 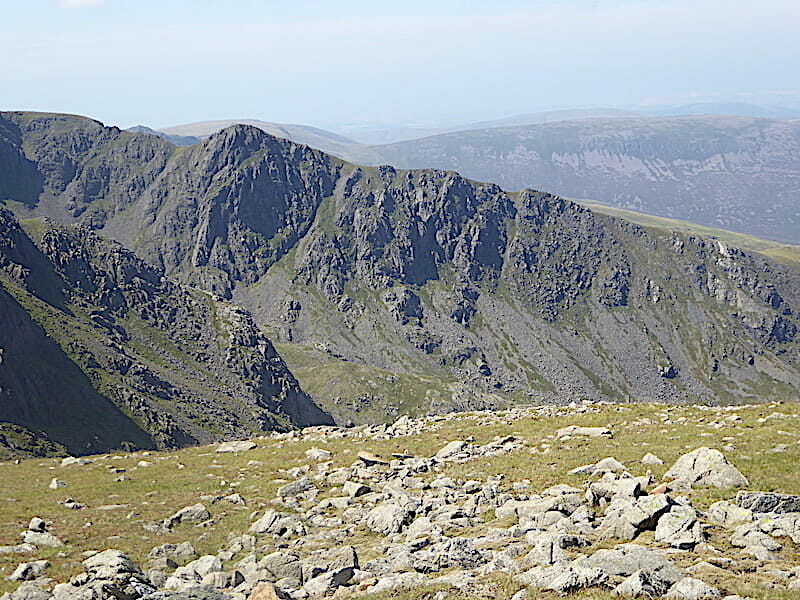 After climbing steadily for just over a mile and a half we reach Scarth Gap and the end of our first bite-sized chunk. 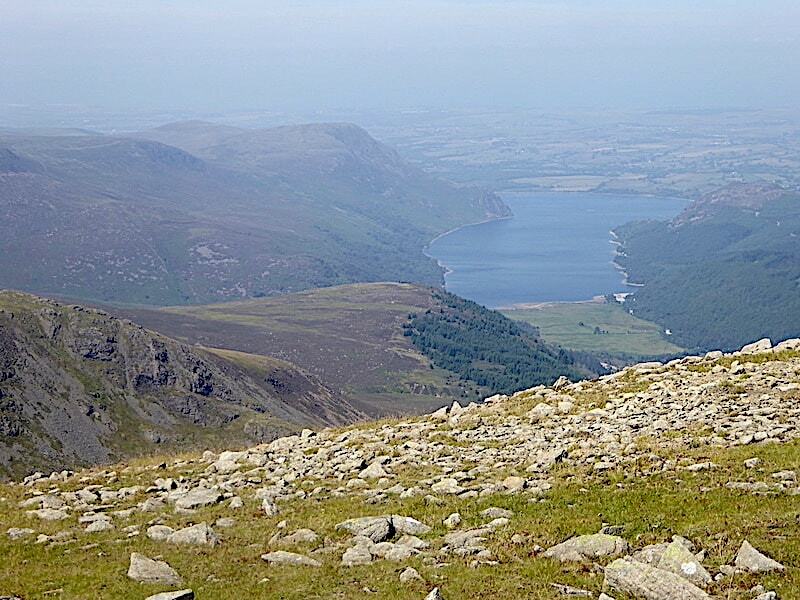 Time for a drink and to mentally re-group in readiness for bite-size chunk number two, the descent into Ennerdale and onwards to the Black Sail hostel. 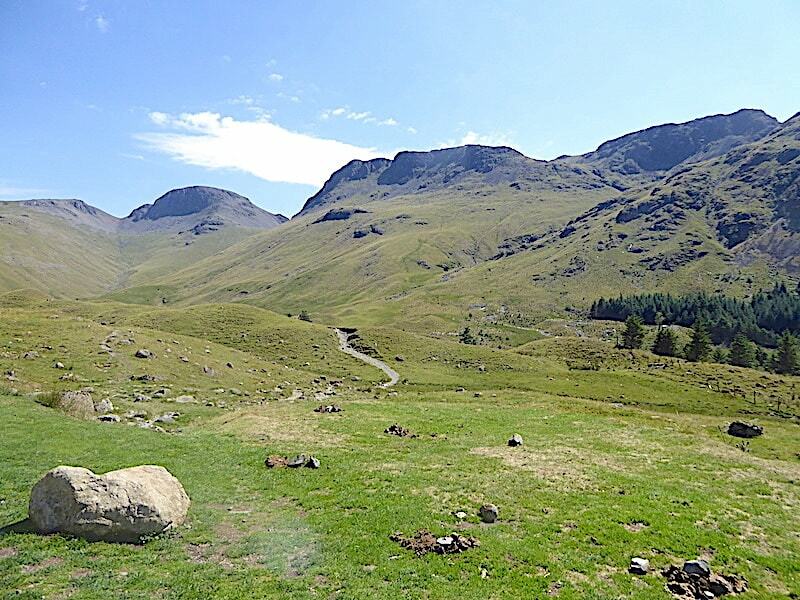 Our skyline view becomes less picturesque and a whole lot more wild and rugged as we gaze at Great Gable, the north and south tops of Kirk Fell and the lower slopes of Pillar. 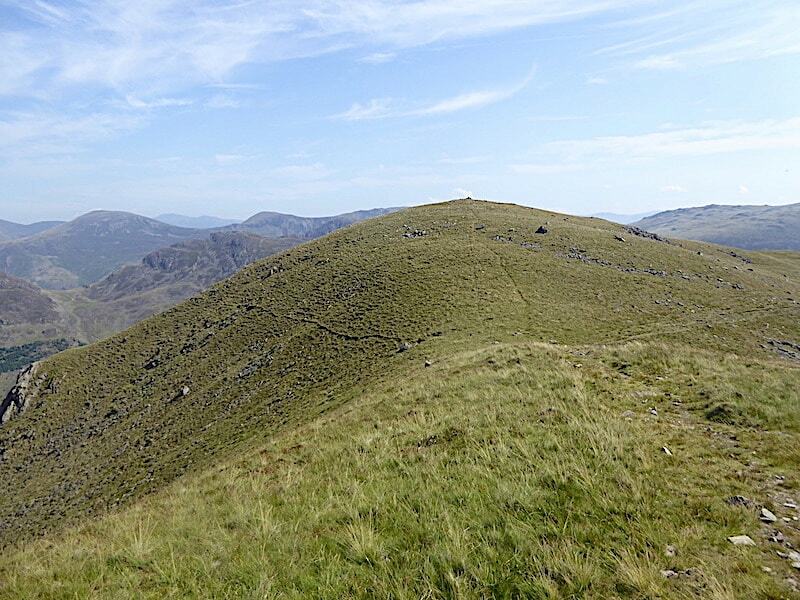 The rounded grassy hump over on the right has its own name, that of Looking Stead. Best not to even begin to think about the loss of hard won height, be positive and think about the views to be had from the remote valley and the break we have promised ourselves when we reach the hostel. 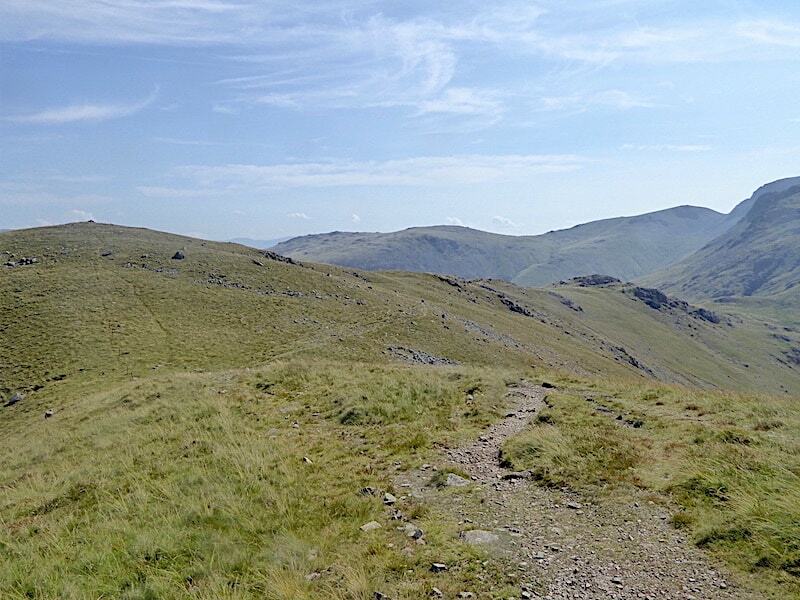 I also remind myself to take note of the path and the gradient as we descend. 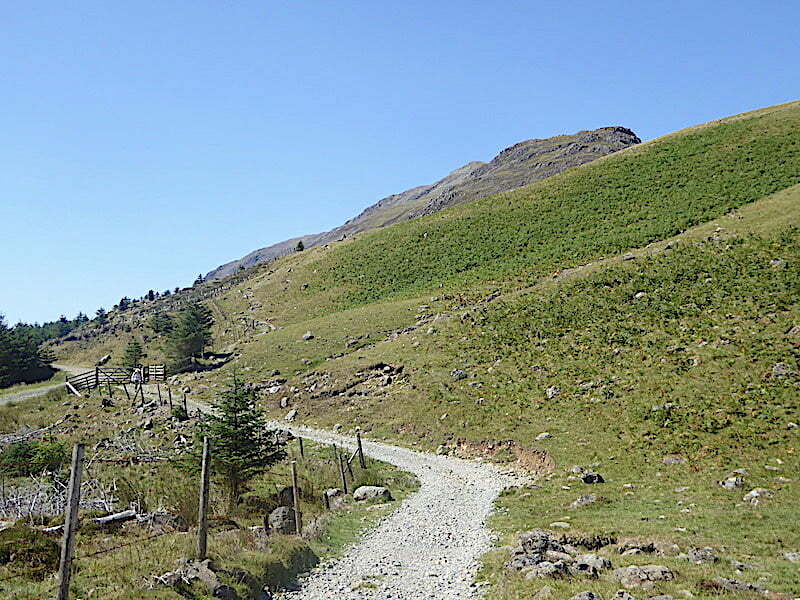 When we return this will be the only section of climbing we’ll have to do but it comes at the end of the walk when legs will be tiring so its useful to know just how much of a climb it will be. 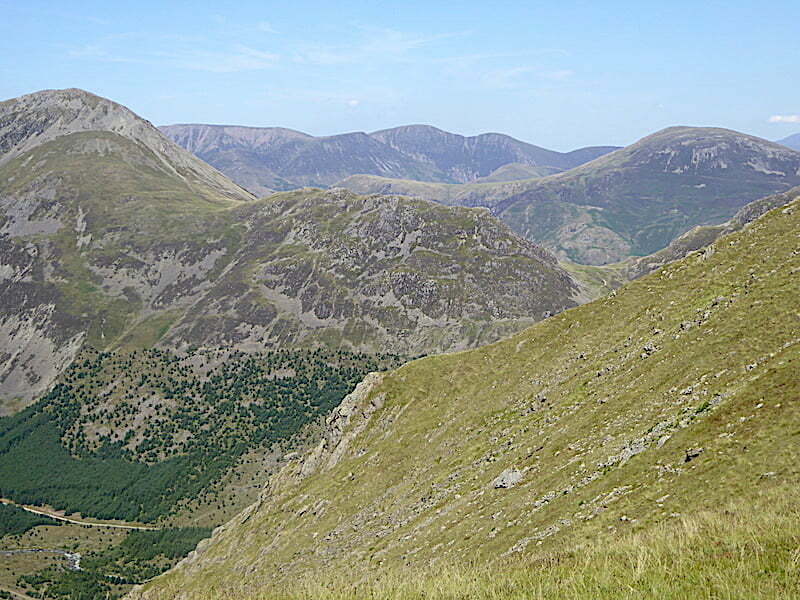 We begin dropping down into Ennerdale on a gravelly path initially which eventually became a very nicely pitched one down some reasonably gentle gradients. The River Liza begins to appear as it meanders its way along the valley bottom and we can see a little more of Green Cove to the right of Looking Stead. We’re almost down to the valley track which provides access for the Black Sails hostel staff vehicles only, no other vehicles are permitted to use it. Across the river, and seeming to take up more than its fair share of the valley, is the vast bulk of Pillar. 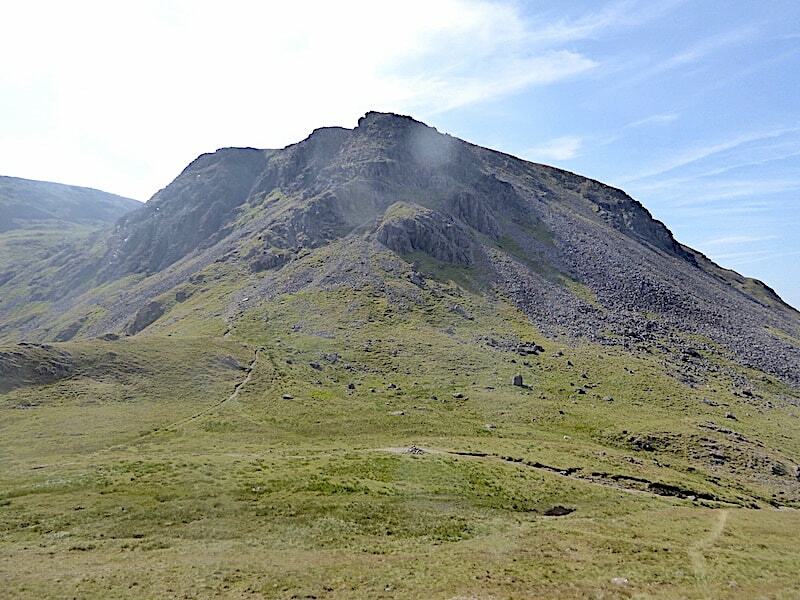 No gently rising grassy slopes await walkers across there, its straight up from the valley floor into a maze of cliffs, crags, gullies, ravines and chasms. A rock climber’s ideal playground. 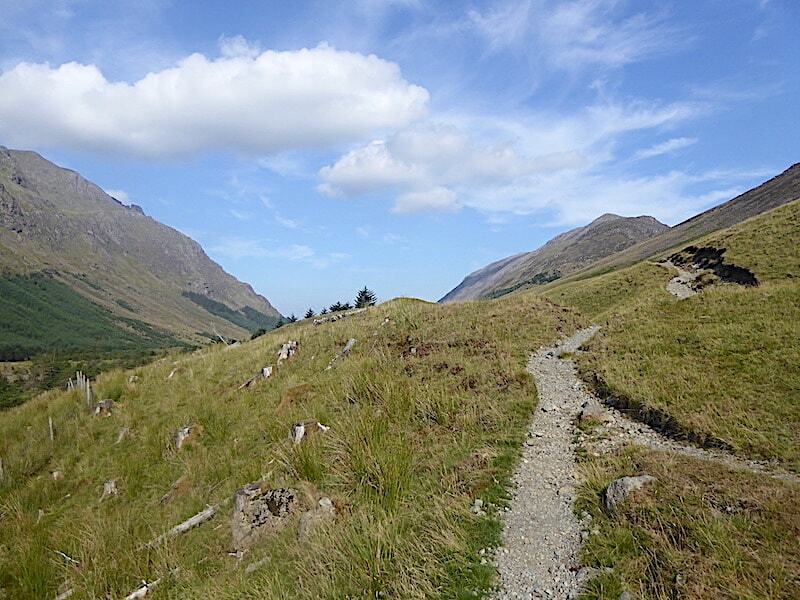 The path leads us down to a handgate and onto the very rocky vehicle access track. A Land Rover, parked beside the hostel, was the obvious vehicle for the job, but even with that I imagine it would still be an uncomfortable ride. 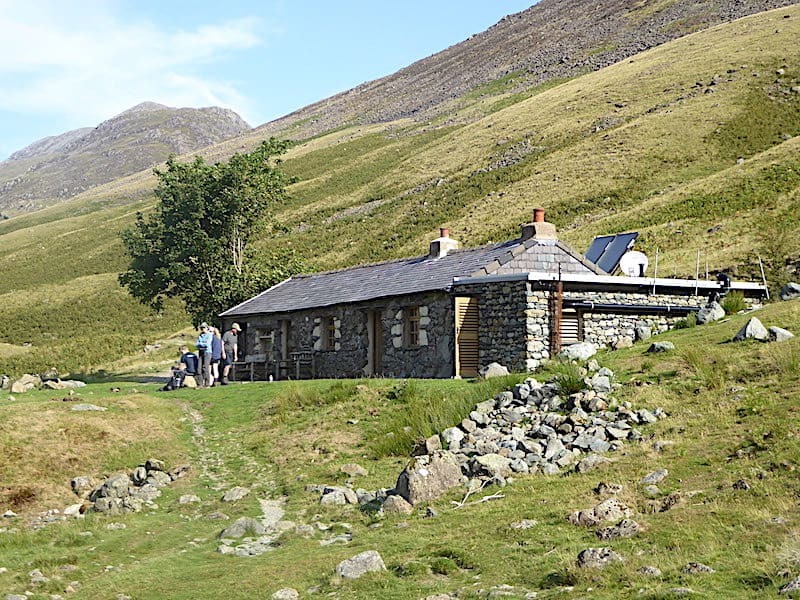 Just over three quarters of a mile from Scarth Gap is the Black Sails Youth Hostel which is open every day from mid March until the end of October. There’s plenty of info about it on the internet so I won’t add further details here. 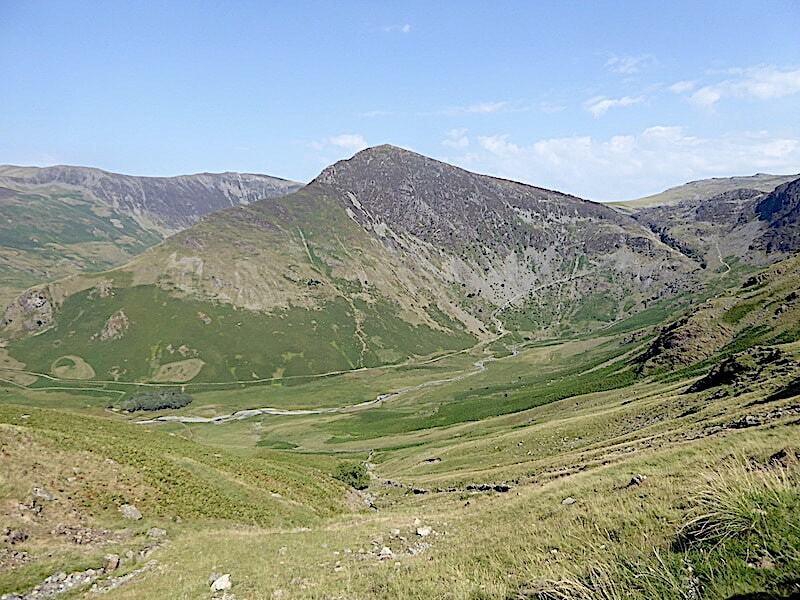 We had already had a chat with one chap who had stayed overnight, he had just passed through the handgate as we were making our way down to it and was on his way up to Haystacks. He’d enjoyed his overnight stay at the hostel and mentioned that the rain a couple of days ago had replenished the hostel’s water supply which was on the verge of running out. 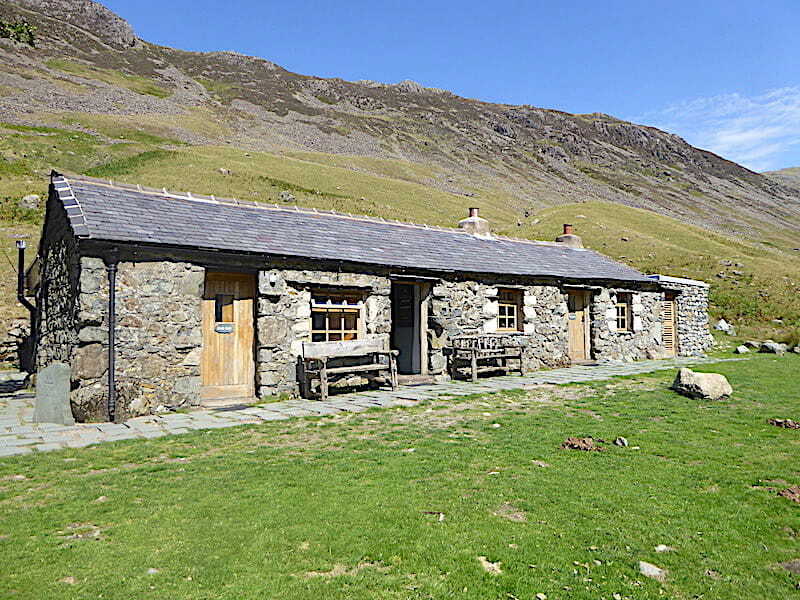 The hostel’s water is apparently taken from a nearby beck coming down from Haystacks. We gave our cheery good mornings to the group of four in the shot as we passed by. We didn’t want to get in anyone’s way by taking a break at the hostel so we carried on a little further until …..
….. it was out of sight, just behind the small rise in the path, and flopped down on a grassy mound for our mid-morning break. Not that it was mid-morning, it was only 9.30 am after all, but having been up and about for a few hours it just felt like it. We didn’t stop longer than five minutes but while we there the group in the previous shot came by, the two fellas carrying packs, the two women carrying nothing. The group crossed the Liza by the footbridge, carried on up the slopes and eventually disappeared from our view, destination unknown, because we never saw them again. 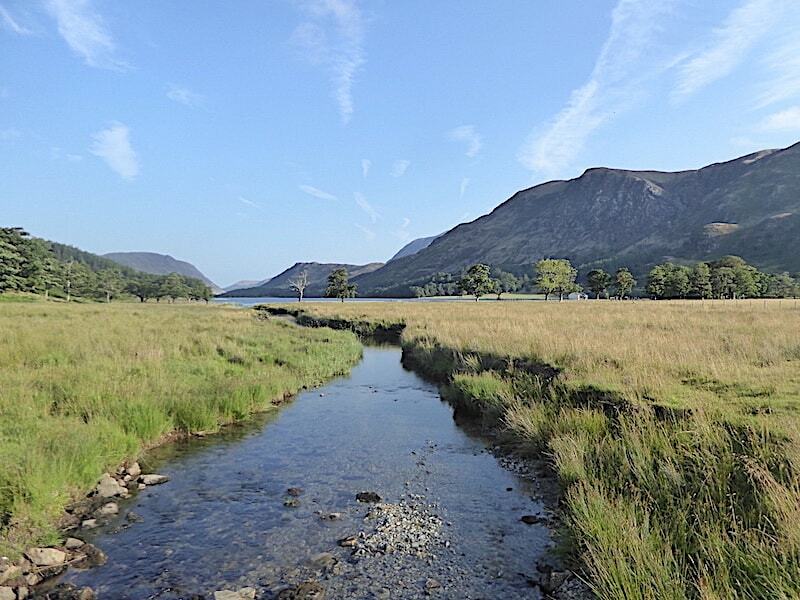 A lovely view along Ennerdale as we crossed the bridge …..
….. and began the third bite-sized chunk, just under a mile of steep climbing up to the Black Sails Pass, the shaded crags of Kirk Fell at the head of the pass are directly ahead of us. 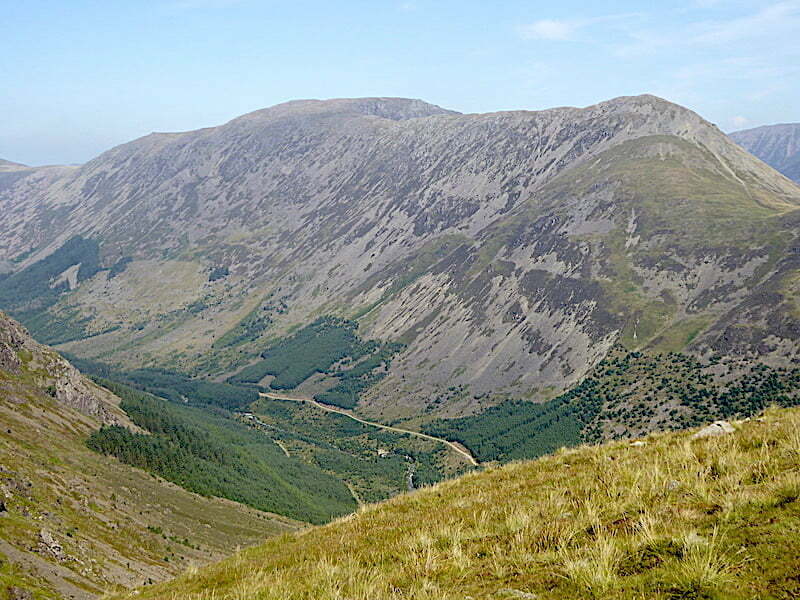 Another look along Ennerdale as we begin the climb alongside Sail Beck up to Black Sail Pass. 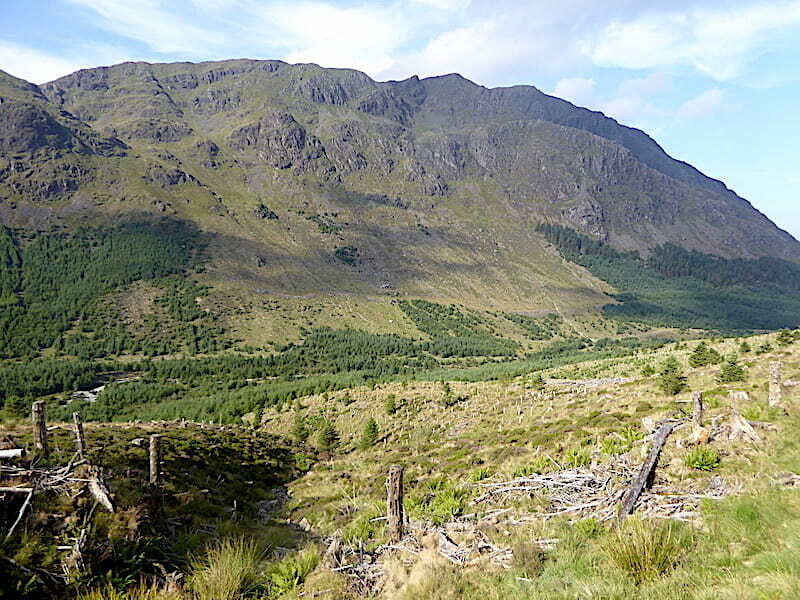 Looking back to the hostel, although it might need a zoom in to locate it beside the path to the right of the stand of trees in the centre. 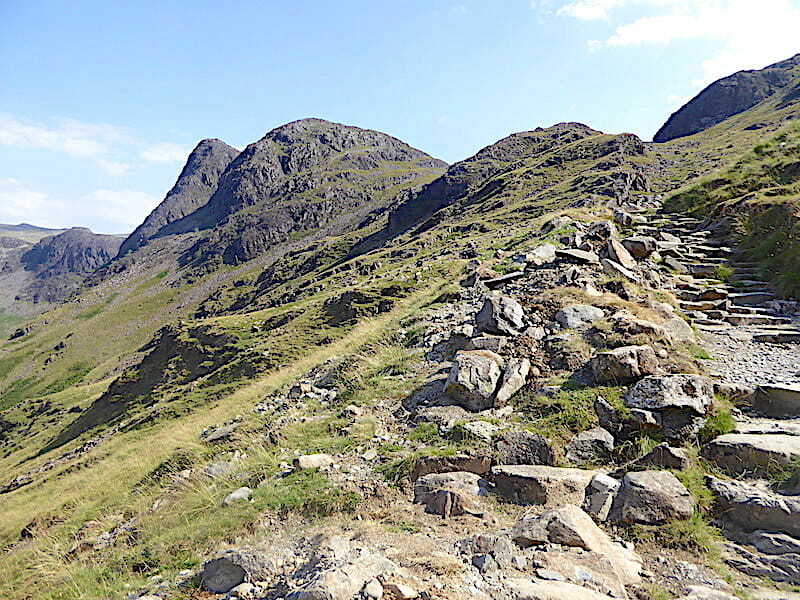 The path tracks back over the lower slopes of Haystacks and gently rises up to Scarth Gap, passing between Seat and Haystacks. I wondered how gentle it would feel on the return journey but away with such imaginings, just keep on climbing. Sail Beck tumbling down to join the Liza, well maybe not exactly tumbling perhaps but a bit more than a dribble. 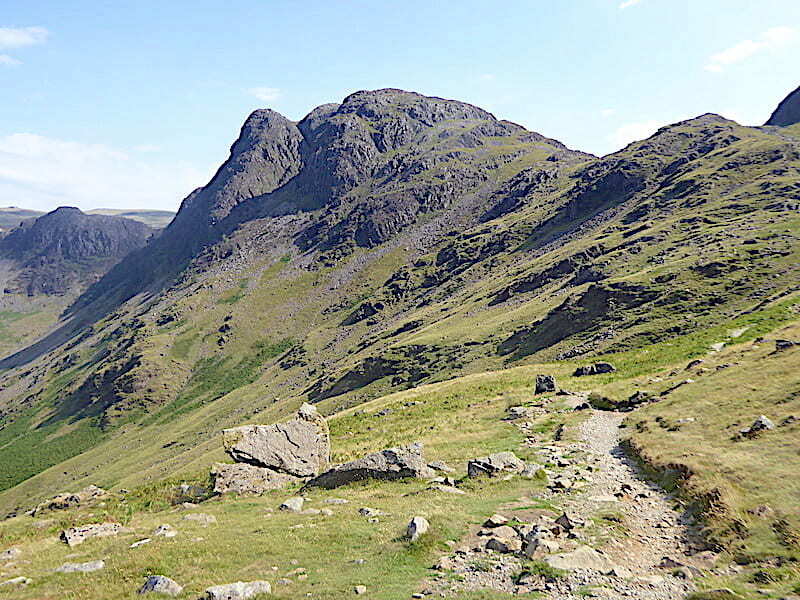 Here, on its southern side, Haystacks finally gets to show itself off as a fell in its own right rather than being overshadowed by Pillar, which it usually is when seen from the Honister side. 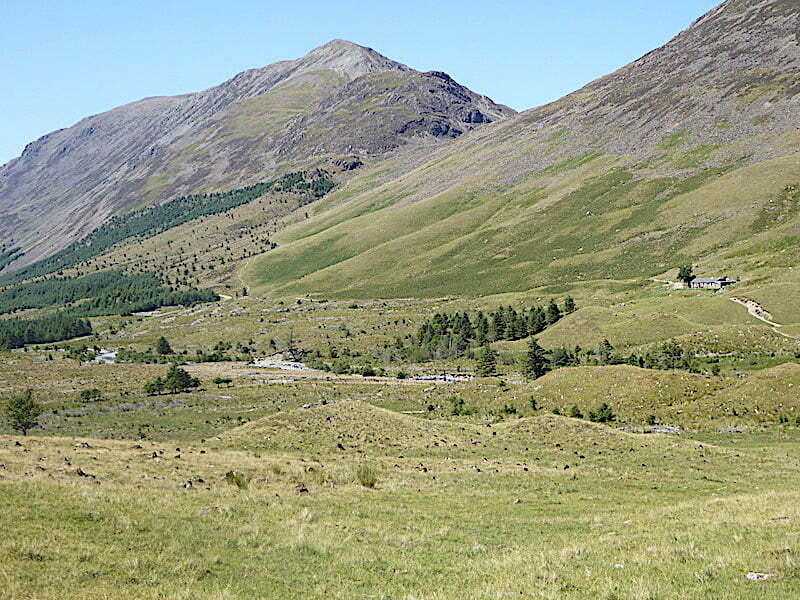 It even boasts its own little set of drumlins as an added attraction. 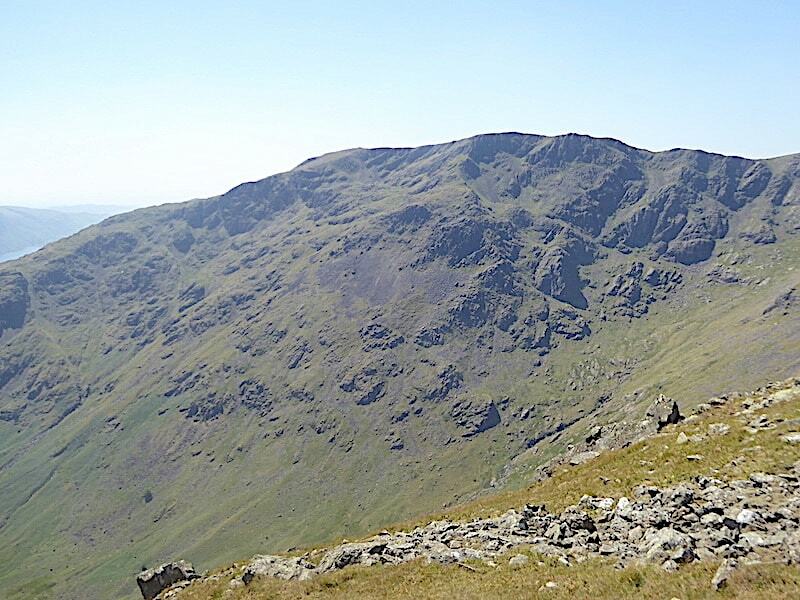 Well, we’re getting closer, and Kirk Fell’s crags are becoming clearer, but there’s still a way to go to the top of the pass and the route has become just that little bit steeper, thankfully the breeze is still around and gradually becoming just a little stronger. 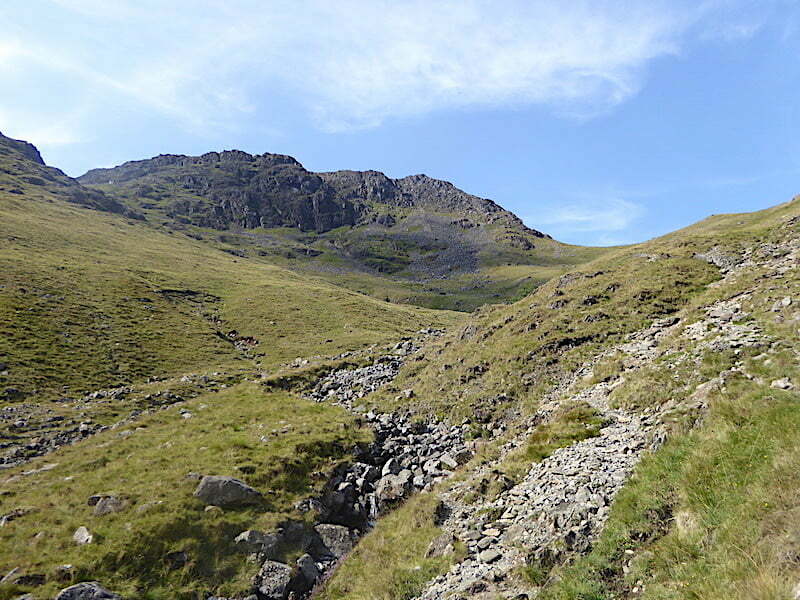 Sail Beck veers off to the left below the crags of Kirk Fell, and the path veers steeply off to the right …..
….. where it changes from grass to loose stone and rock. 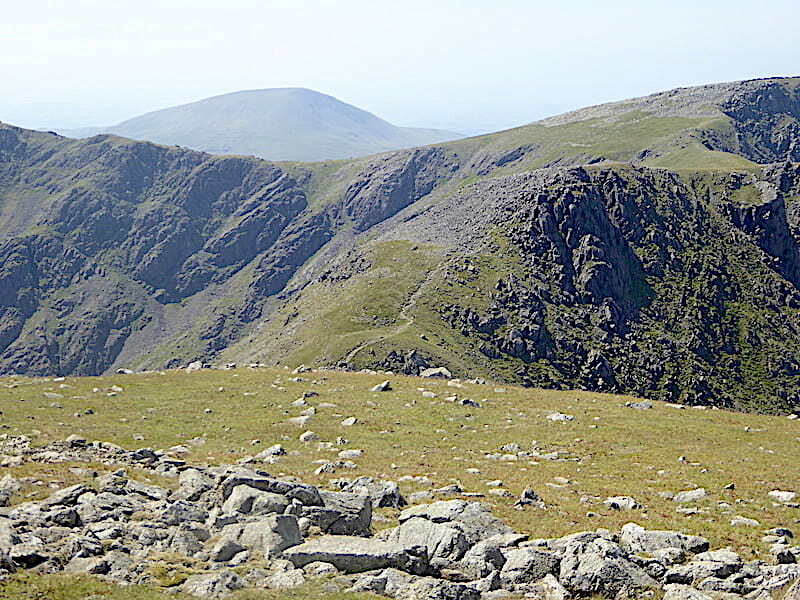 Across the valley we can see Grey Knotts with Brandreth just behind it, which in turn rises up to Green Gable across Gillercomb Head, they look much less familiar from this perspective. The path was a bit of a trial because of its loose and slithery surface, taking to the grass on either side was a more comfortable option. 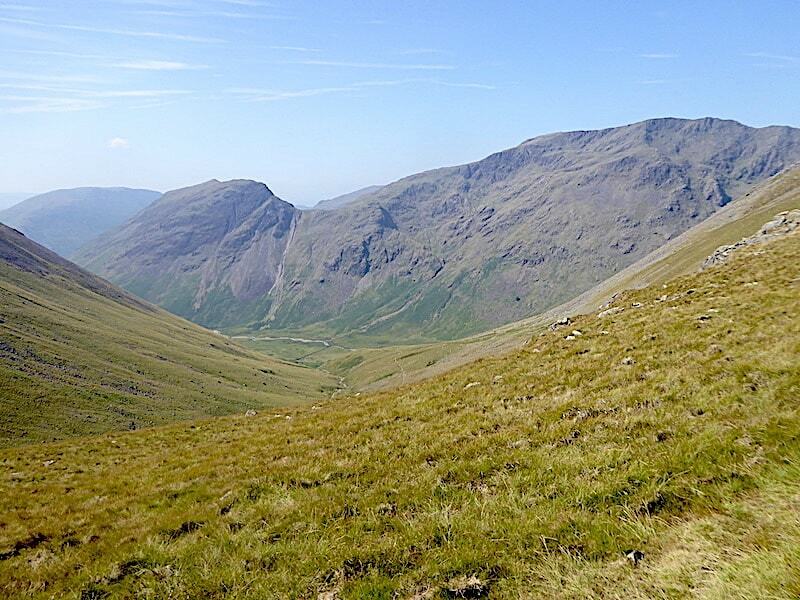 Kirk Fell and its crags as we reach the top of Black Sail Pass …..
….. and a look back to the point where the path along Mosedale from Wasdale Head also reaches the top of the pass. 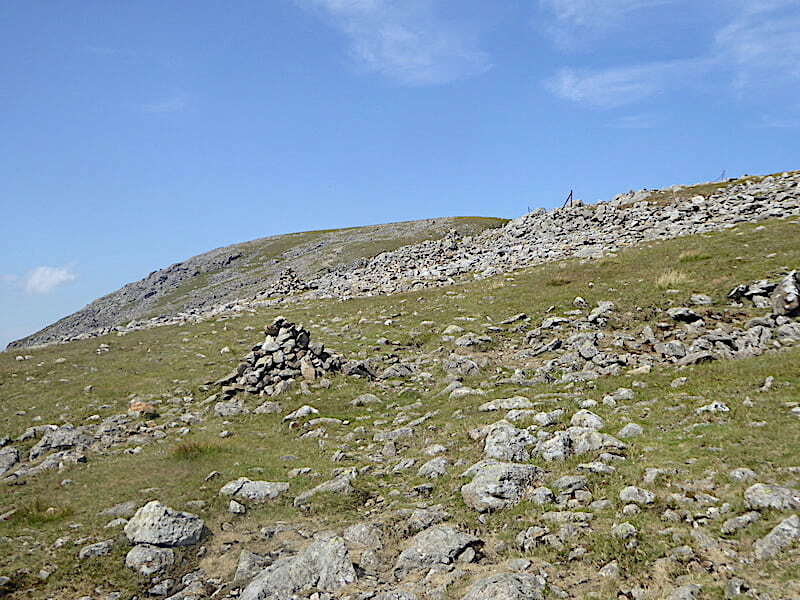 The start of the path up to the summit of Kirk Fell is clear enough to see but then it becomes camouflaged by the crags. Trying to locate the old iron fence posts which AW mentioned would serve as a guide was difficult from below. Ah yes, I remember it well! 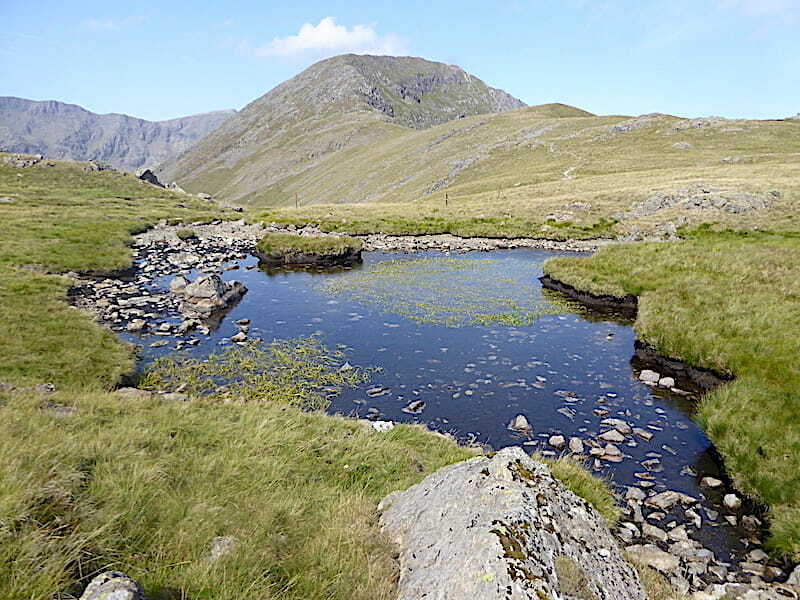 Time stop reminiscing and begin thinking about the fourth bite-sized chunk so we turn around and climb the rising ground above the pass …..
….. to this little tarn where we have a five minute rest and drinks stop and …..
….. get our first proper look at bite-sized chunk number four, the two miles of walking between here and the summit of Pillar. 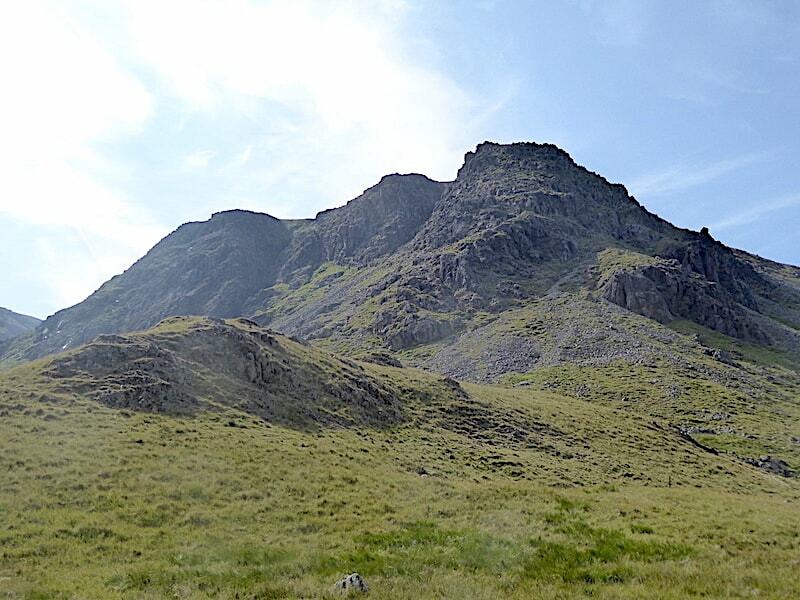 This also gets broken down into smaller chunks and to begin with we head off across the stretch of undulating ground making for Looking Stead, the grassy mound just to the right of Pillar’s craggy western face. 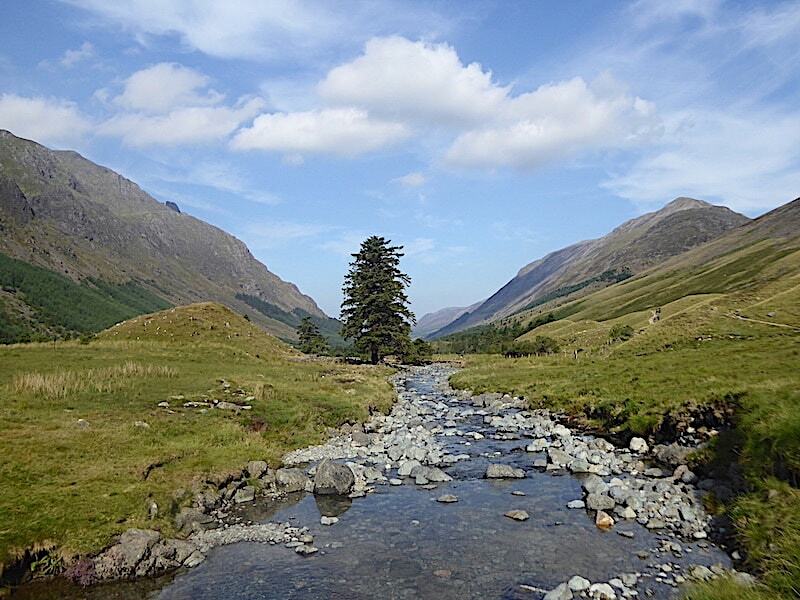 Along the way there are some spectacular views along Mosedale. 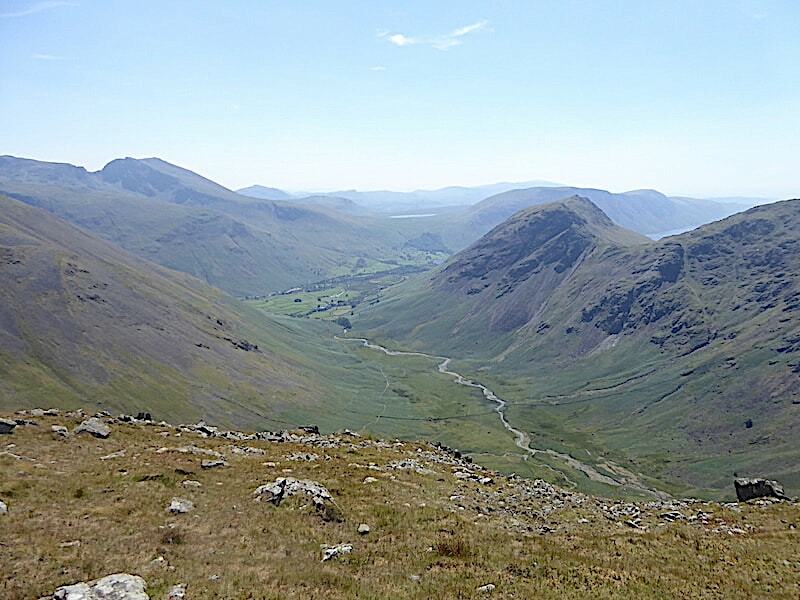 Across the valley are the fells we walked exactly one week ago, Yewbarrow and Red Pike separated by the little col at Dore Head. When we reach Looking Stead there’s a magnificent view along Ennerdale with the Red Pike-High Stile-High Crag ridge soaring above it. 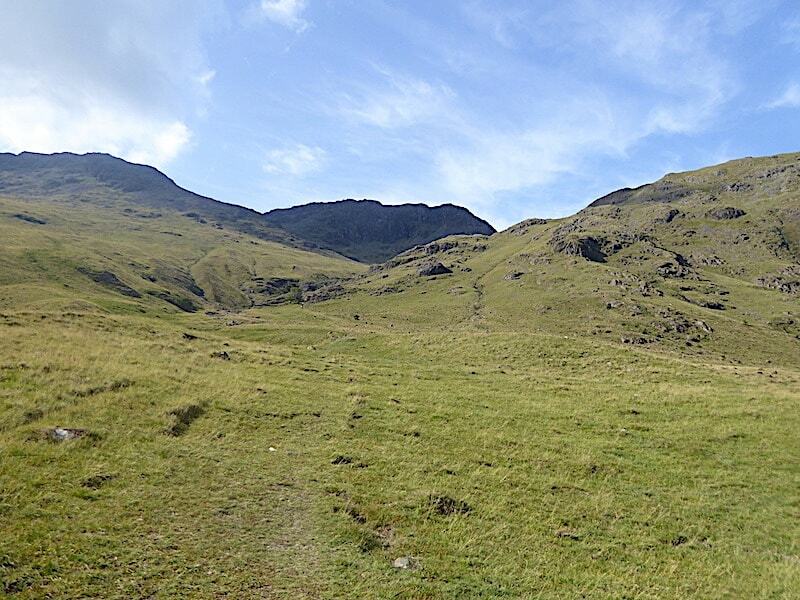 We make our way back from Looking Stead and rejoin the path where we’ll tackle the next mini-chunk, the steep climb through the maze of outcrops up to the top of the first rise. 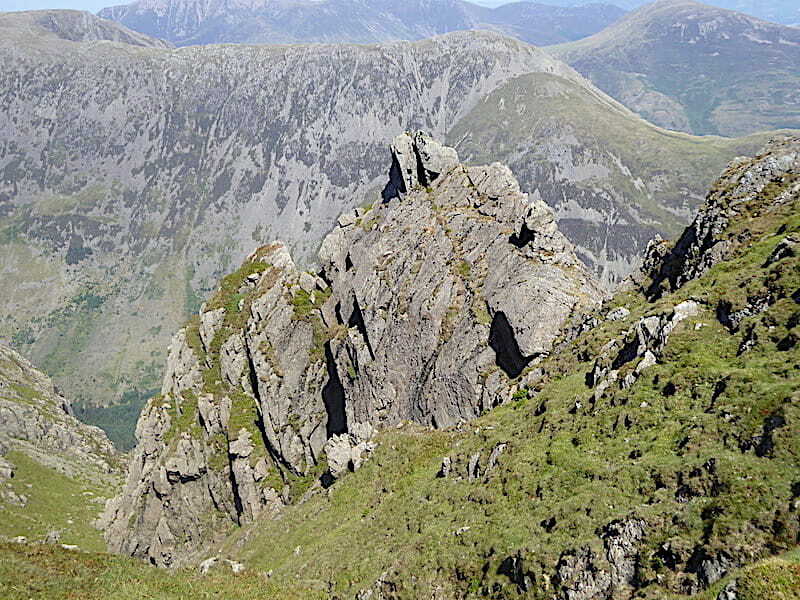 The start of the High Level route across the Ennerdale face of Pillar can be seen threading its way through the crags. 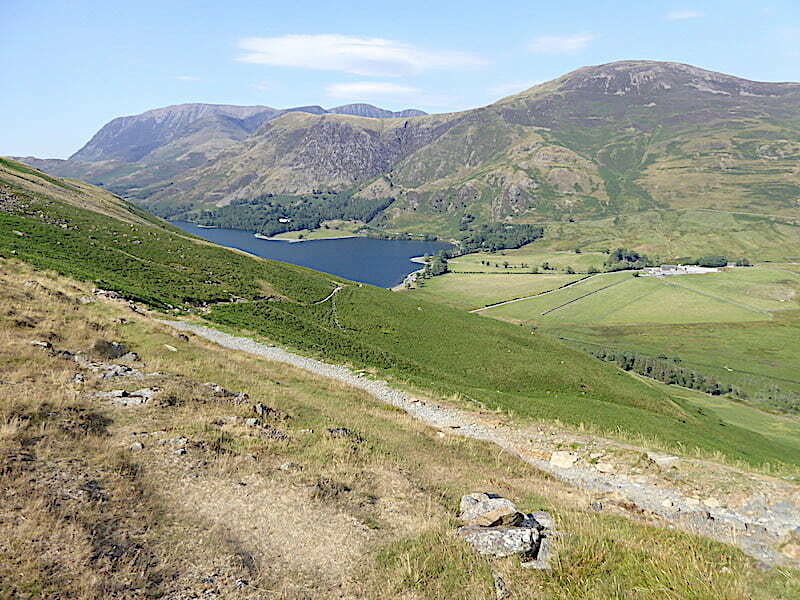 Another look across Ennerdale to the fells beyond as we rejoin the path …..
….. and take a look back at Looking Stead …..
….. and beyond Looking Stead to Grey Knotts, Brandreth and Green Gable. Now for the rather more interesting task of clambering through the tangle of rocks, boulders and crags where hands were put to use at times. There is a path, although it can be temporarily mislaid when crossing one of the larger areas of rock strewn ground, the line of old iron fence posts is a useful guide. 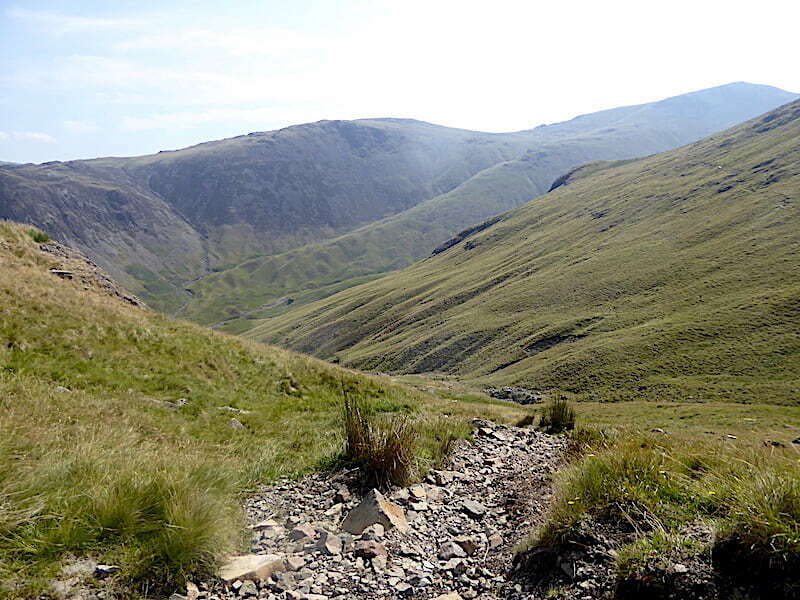 Almost at the top of the rise and a chance to look along Mosedale. 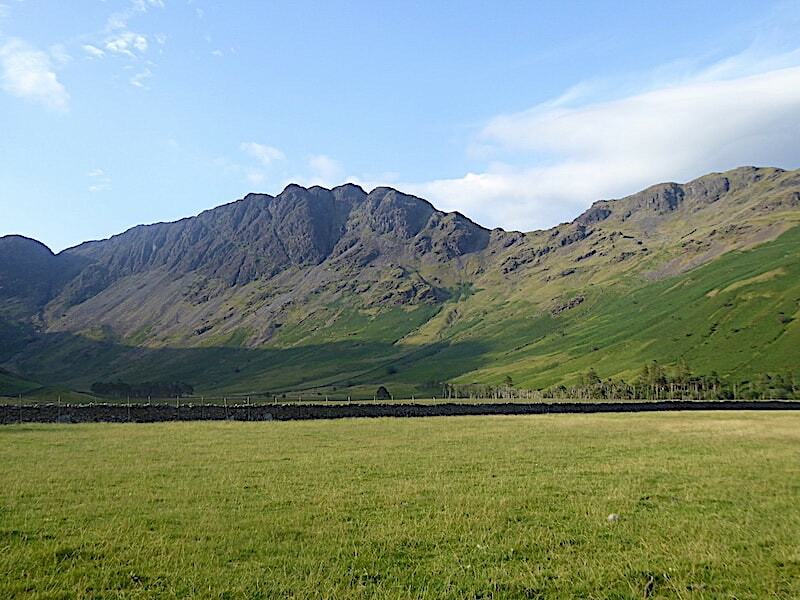 You might be able to pick out the buildings of the Wasdale Head Inn more or less in the centre of the shot. 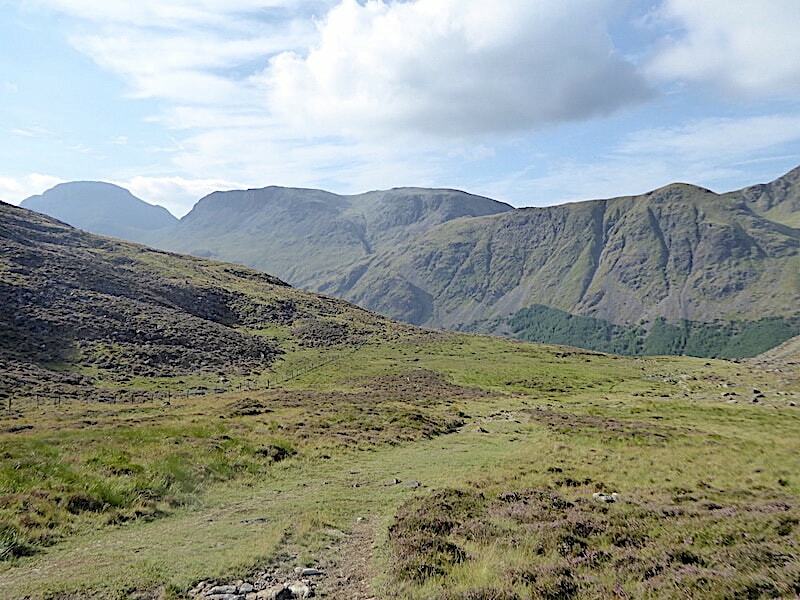 The Scafells are just putting in an appearance behind Kirk Fell on the left with Yewbarrow over on the right. The breeze had turned into a slightly stronger wind by now as the air was funnelled up the valley towards us. Not enough to blow us over but not nearly enough to clear the very hazy conditions either. I wait for J as he digs in and crests the final rise. A little lower down he’d asked me why I wasn’t puffing and panting as much as he was. Well, that simply isn’t the case, I get just as much out of breath as anyone else, maybe its just that my puffing and panting is a bit quieter than his. Once over the first rise we have the next mini-chunk, a pleasant, get your breath back stroll across another grassy stretch before we have to tackle the next rise. 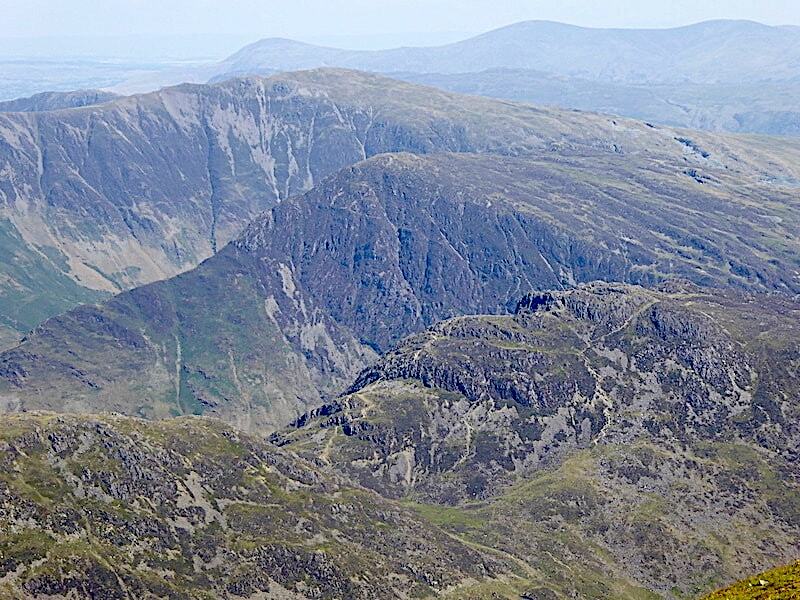 To the left of Pillar, across Wind Gap, is Black Crag followed by Scoat Fell. 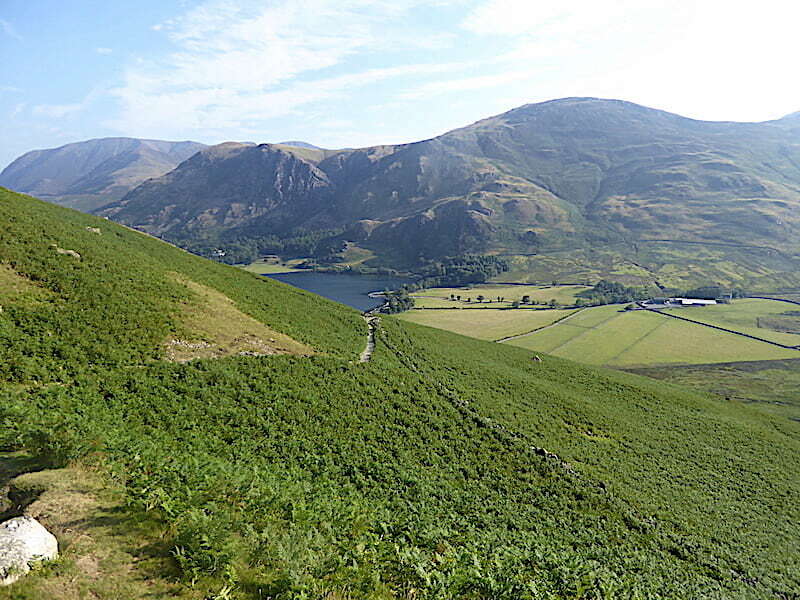 Yewbarrow and Red Pike again as we enjoy the steady stroll across …..
….. and make our way towards the next mini-chunk, the second of the bouldery rises. The third rise has disappeared behind it for the time being. Here we go again, picking our way up the rise with J trying not to inadvertently land on a wobbly bit and give his ankle a jolt. Behind us is the restful grassy stroll between the first rise and this one. 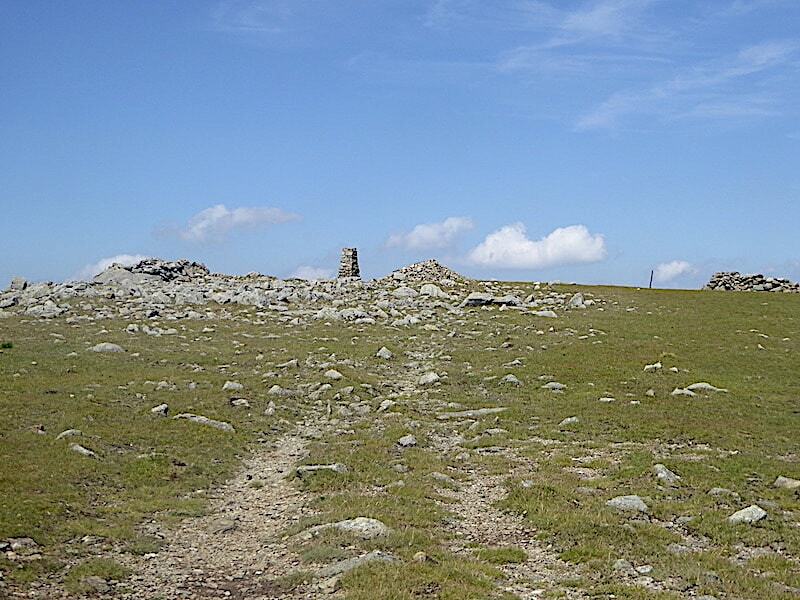 It can seem jumbled and confusing here and there but the line of cairns help keep walkers on the straight and narrow, not that there is much of anything which could be called either straight or narrow. The third rise is starting to appear again and now we’re beyond the funnelling effect of the valley the strongish wind has subsided and we’re back to breezy once more. 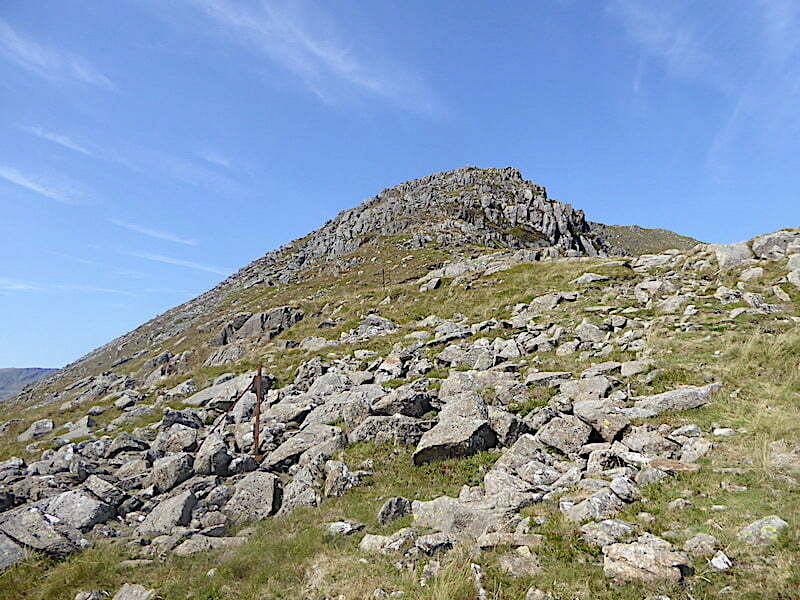 The last mini chunk is the walk to the summit which continues across another grassy and stony rise. 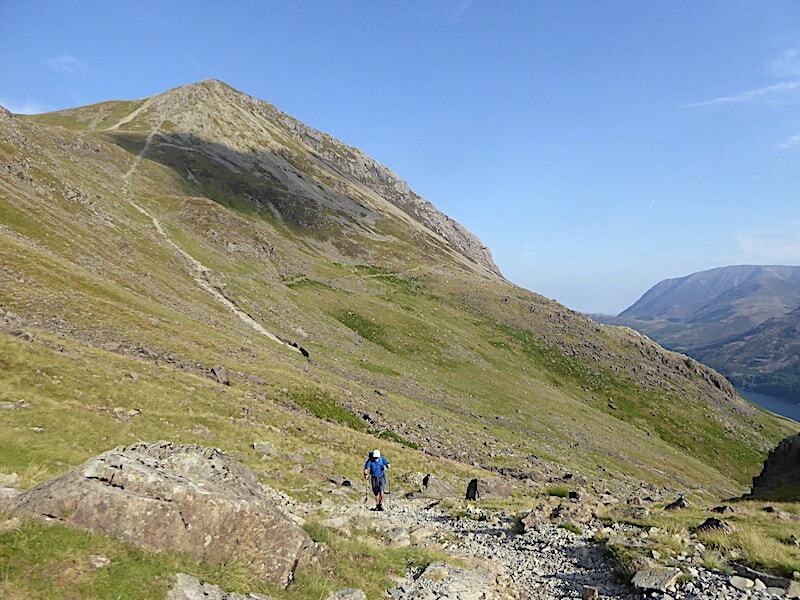 Its not in your face steep but legs are needing a rest and stomachs need re-fuelling so we draw on the tank of will-power and get going again. My route takes me alongside the edge where I can indulge in a spot of gully peering, J keeps to the middle line, gully peering is not his cup of tea at all, and as for following the High Level Route across the crags soaring above Ennerdale, that is an absolute non-starter as far as he’s concerned. I expect that each gully will have its own special name but I have no idea what they are if they do, I just like the jaw-dropping views down them. 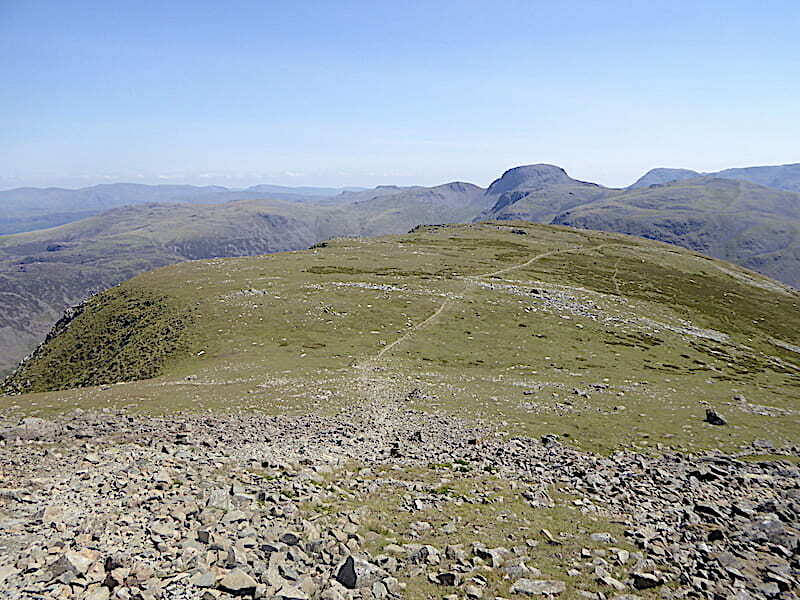 Wonderfully extensive views all around as we plod our way upwards. On the distant skyline are Skiddaw, on the left, and Blencathra on the right, and its not very often you can get both of them in one shot. 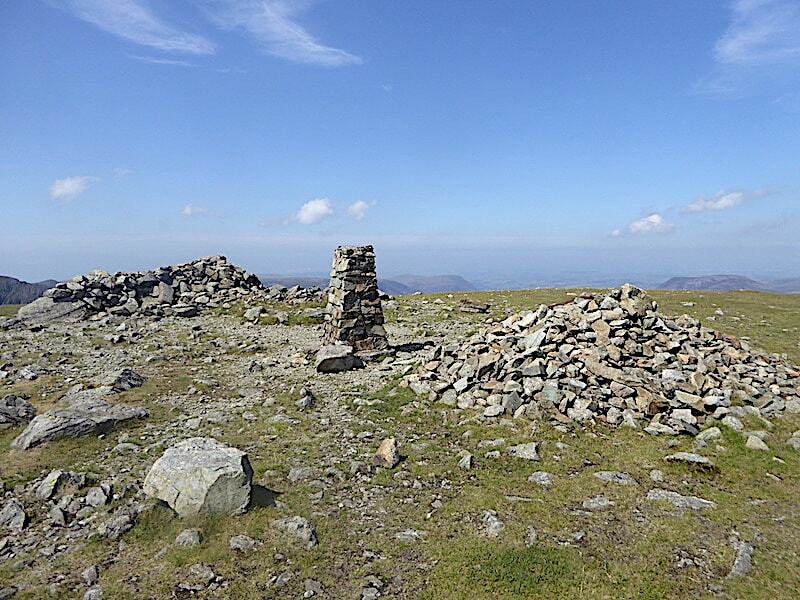 We drag weary legs further up the slope until, finally just around noon, the trig column comes into view and the summit is achieved. Wonderful isn’t it, how the legs instantly feel better the minute they are on flat ground? 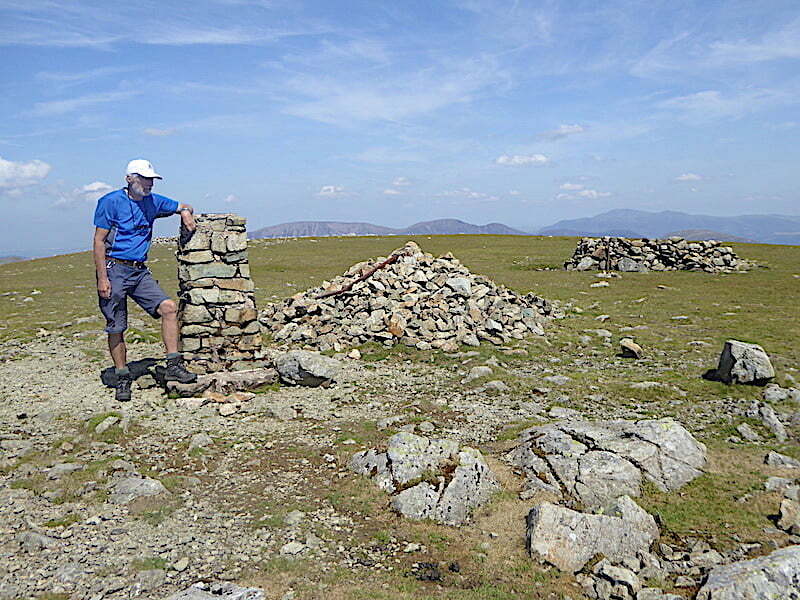 There are lots of shelters dotted around up here, more than I could remember but it is a long time since we were up here and perhaps I haven’t been very observant in the past or too keen to carry on around the horseshoe.. 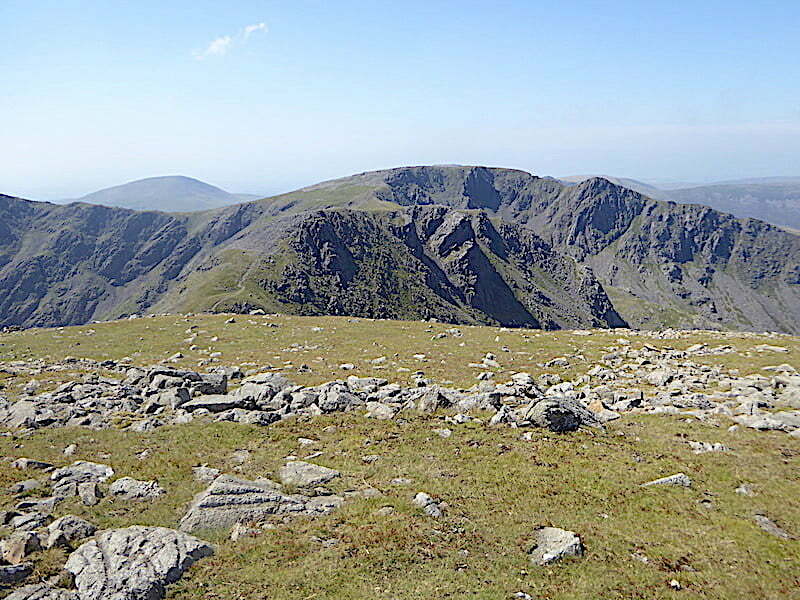 There was one other walker on the summit when we arrived, just a chap wandering around by himself and taking in the views and he was quite a distance away so we didn’t have the chance to speak to him. We downed packs in the shelter to the left of the trig column and settled down for a spot of re-fuelling and some rest and recuperation for the legs. 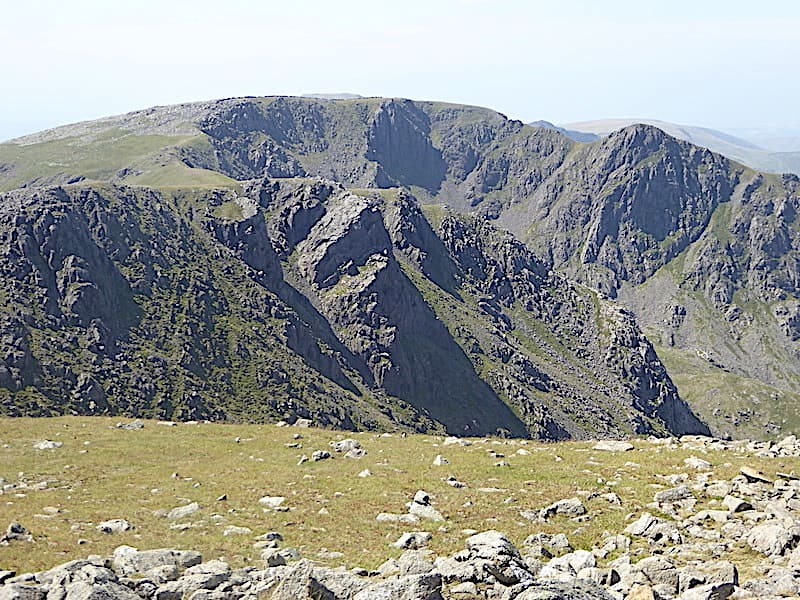 The first walker eventually began making his way back down towards Black Sails Pass and another one arrived, together with his dog, from the direction of Wind Gap. This chap wasn’t carrying a pack and was wearing just a pair of everyday trousers, an ordinary short sleeved shirt and a pair of very well used trainers, looking for all the world as if he’d just stepped out of his back door for a potter around the garden. Pillar is a long way from anywhere and it isn’t exactly easy to get to so he’d had a long walk wherever he’d started from, which is why it was surprising to see him with nothing other than the clothes he was wearing, not even a bottle of water. How the heck had he’d managed without anything to drink? 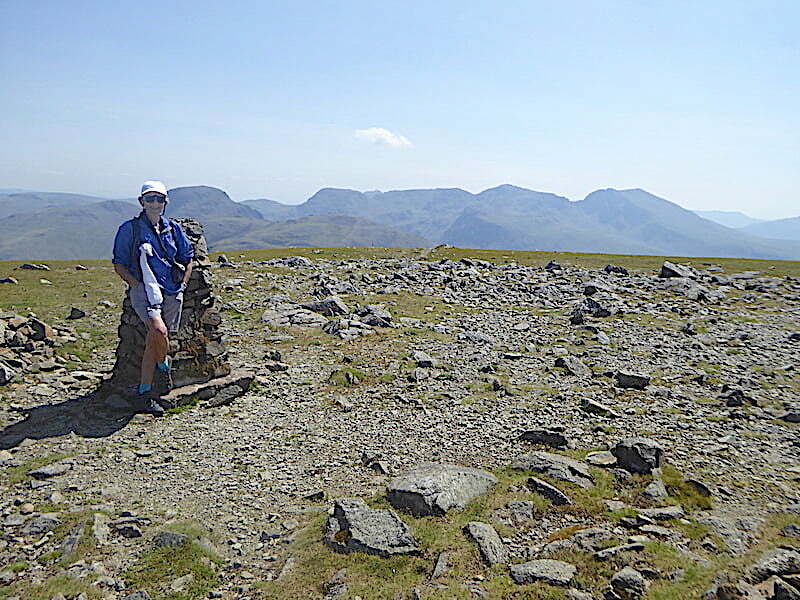 Pillar’s summit area, a vast grassy plateau punctuated by an assortment of shelters and patches of loose rock where there is absolutely no chance of falling into a gully or over a precipice so J is entirely comfortable leaning on the trig column and enjoying the views. You could land numerous helicopters, play several games of cricket, rugby and football all at once up here and still have plenty of space left over. The white dangly thing hanging from the strap of my pack is my trusty little face mopper which I forgot on our last walk. Having remembered it today I barely had to use it on the way up as the breeze did a grand job of keeping me cool, sod’s law taking effect as usual. I donned the windproof for our break in the shelter and, as the breeze continues to be on the lively side, I kept in on because it was still a little draughty up here. 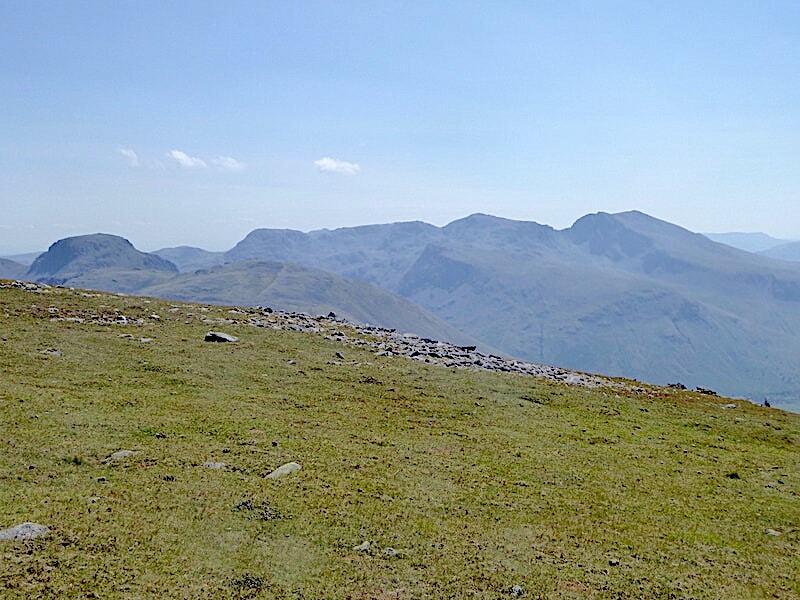 We did a clockwise perambulation around the perimeter of the plateau to take a look at the different views so here we are once again looking across to the Scafell group, still looking a bit fuzzy. Its even fuzzier to the south. Beyond the foreground view of Yewbarrow and Red Pike, Illgill Head and Seatallan were identifiable but very little else beyond Burnmoor Tarn. 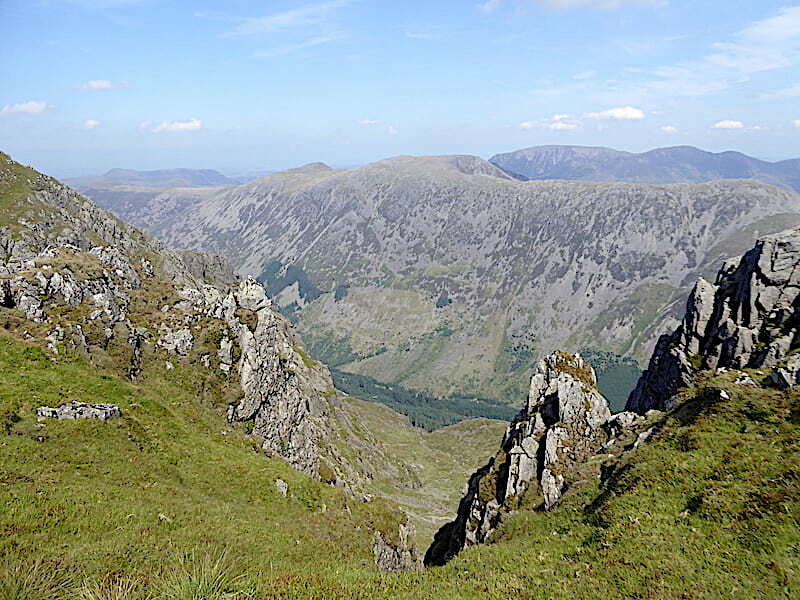 Looking across Wind Gap to Black Crag, Scoat Fell and Steeple. The walker carrying nothing with him popped up from that direction. He was gone by the time we’d completed our circuit so I don’t know which was his descent route. 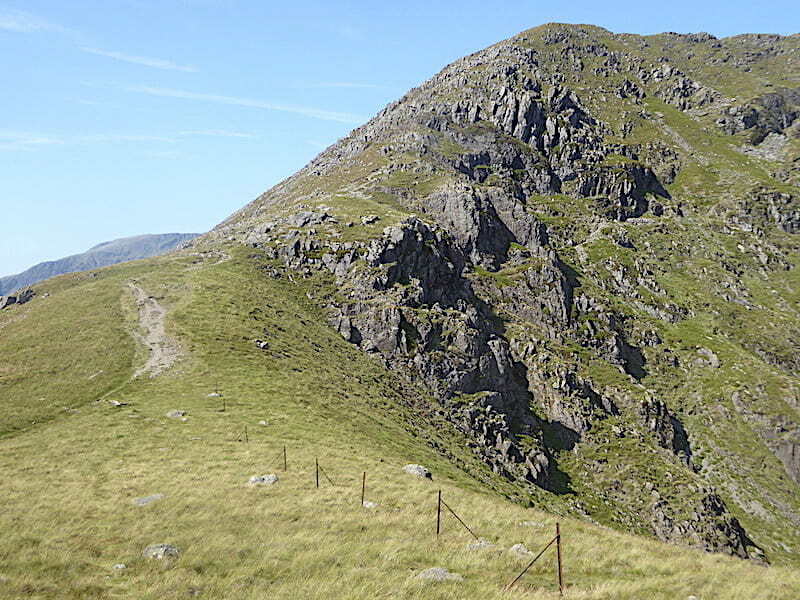 A closer look at the path up to Black Crag and its boulder field from Wind Gap. I didn’t go further down for a look but I remember the path down to Wind Gap from this point was very steep, loose and unpleasant to walk on. 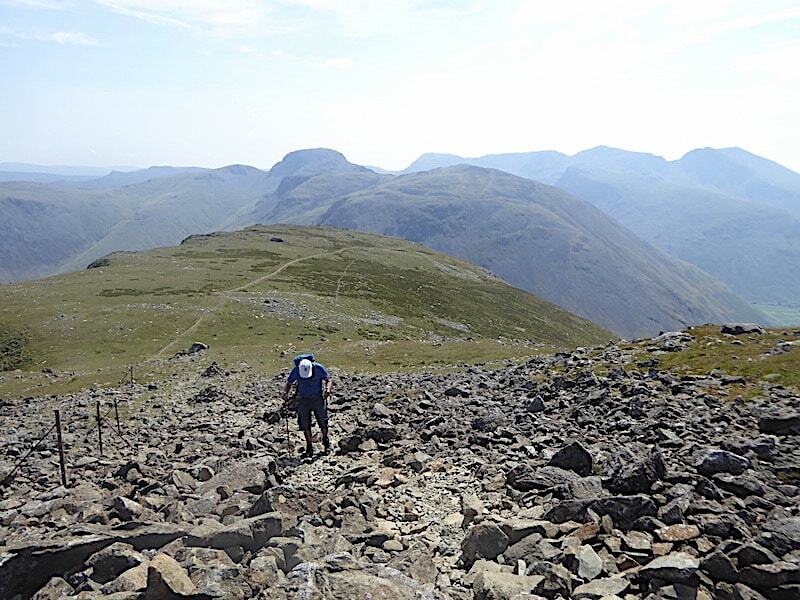 Once across Black Crag there are plenty of walking options, over to Scoat Fell and beyond, or bearing left across the little col, in front of Seatallan, to continue over to Red Pike, Yewbarrow and back down to Wasdale. 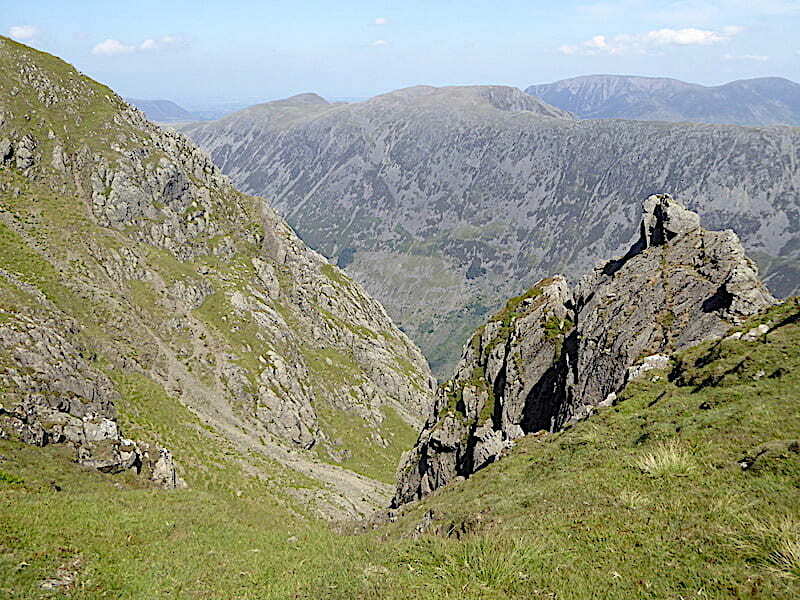 A closer look at Black Crag with Scoat Fell behind it across the chasm of Mirk Cove. Steeple on the right looks almost insignificant when viewed from Pillar. 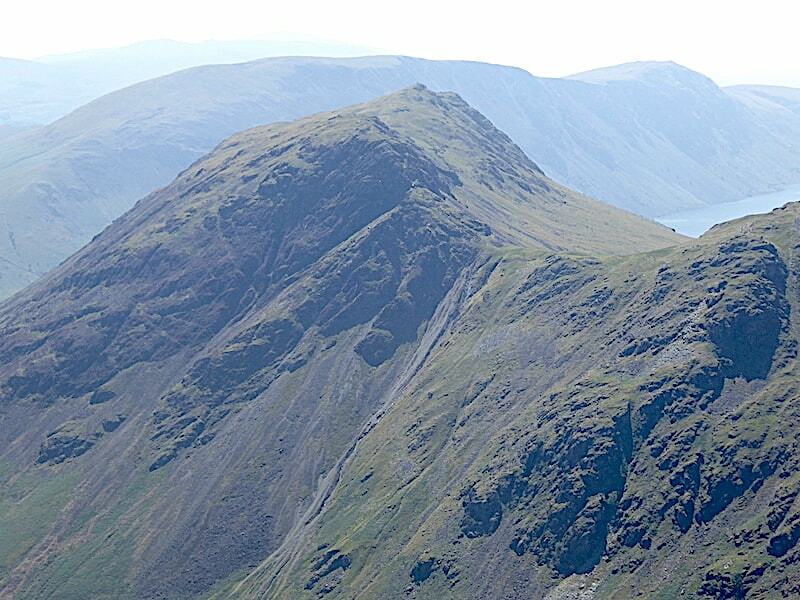 Although its simply a very large and distinct lump of rock on the side of Scoat Fell AW bestowed separate fell status on Steeple by giving it its own chapter in his Pictorial Guide to the Western Fells, in which case it should have a photo in its own right, so here it is. A little further round and Ennerdale Water comes into view. The air was still hazy so this is a close up shot. This is how we were actually seeing it. 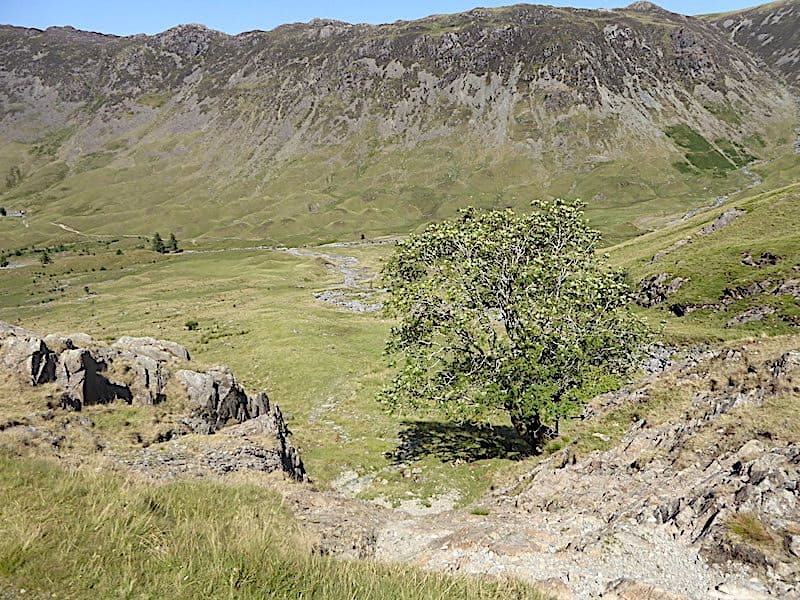 We could just about make out Crag Fell at the far end of the left shore but Great Borne could be seen a little more clearly above the tree line on the right. A big zoom in on Great Borne. 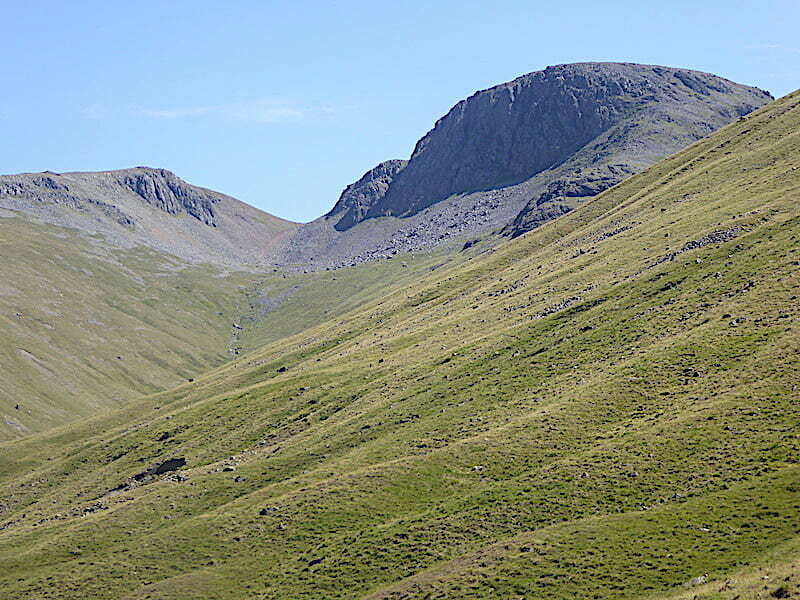 Turning back towards the Ennerdale side of Pillar and most prominent are Red Pike (not the Wasdale one, this is the Buttermere one, yes its confusing but we’re stuck with it) which then leads over to High Stile, nearest the camera on the right of the shot. 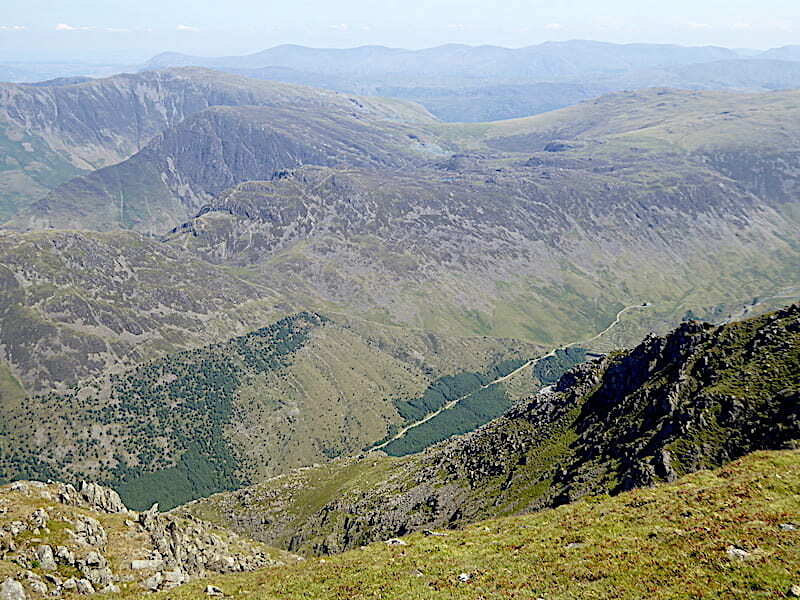 Across the Red Pike ridge is a skyline view of Blake Fell leading over to Carling Knott, with just a smidge of Burnbank Fell peeping above the ridge line. 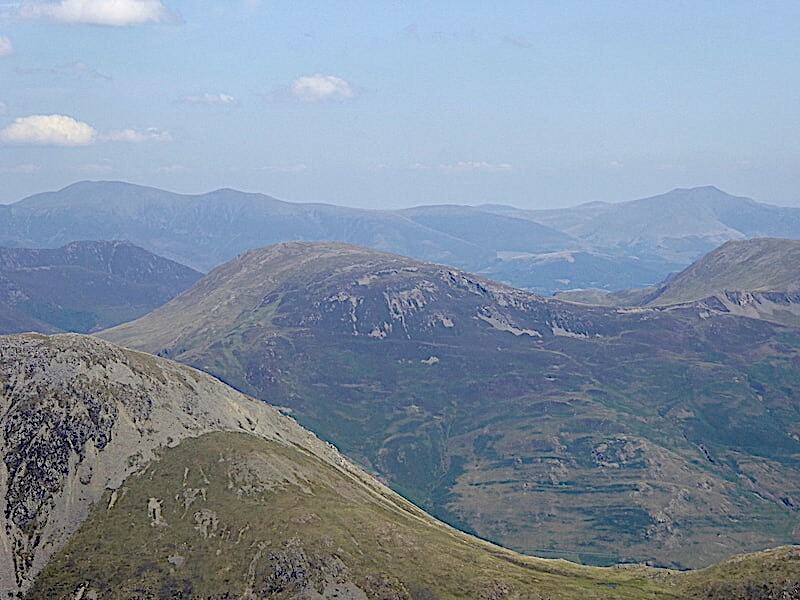 Still looking across Ennerdale and now we have the whole of the Red Pike – High Stile – High Crag ridge directly opposite us. 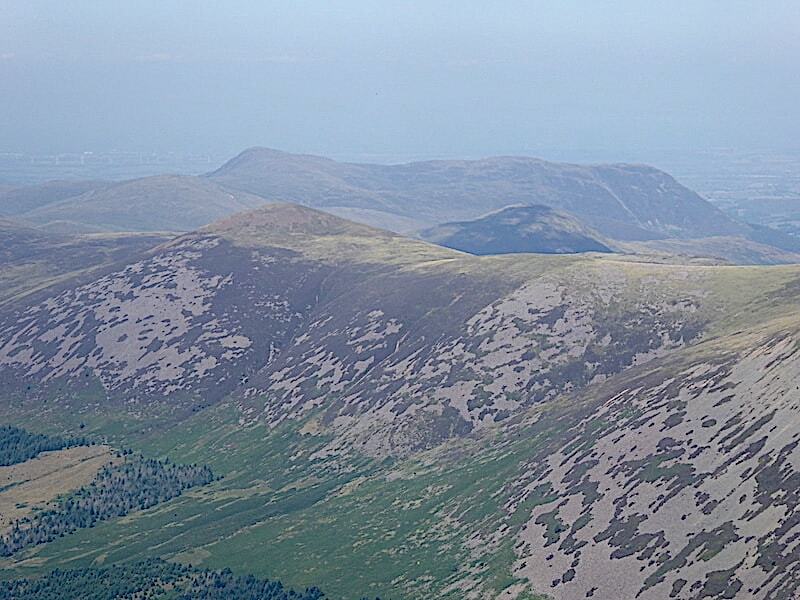 Beyond is Grasmoor with some of the north western fells to its right. 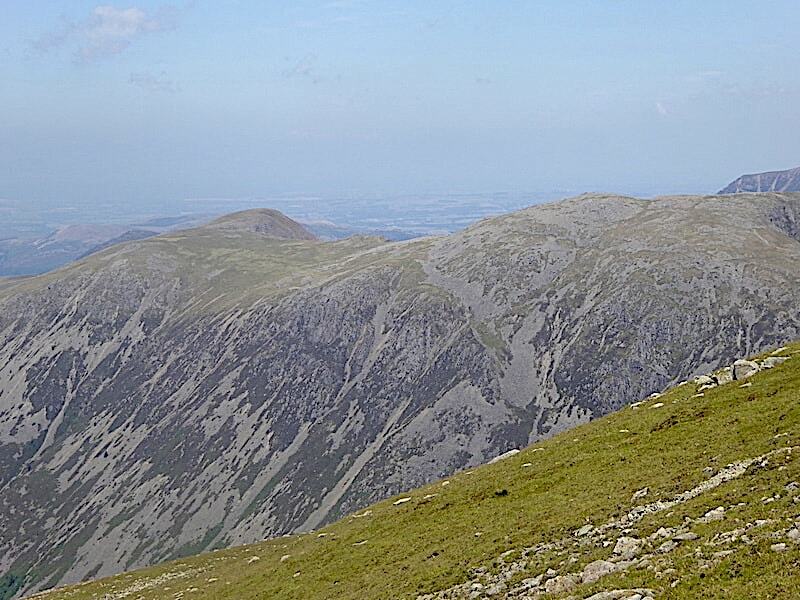 Skiddaw has also managed to sneak into the shot. 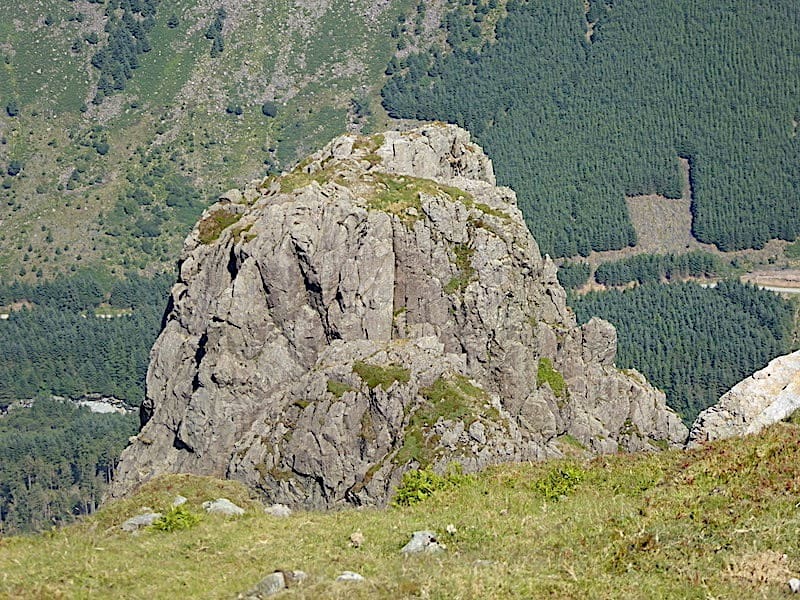 Pillar Rock, one of Pillar’s most well known features and a magnet for rock climbers. 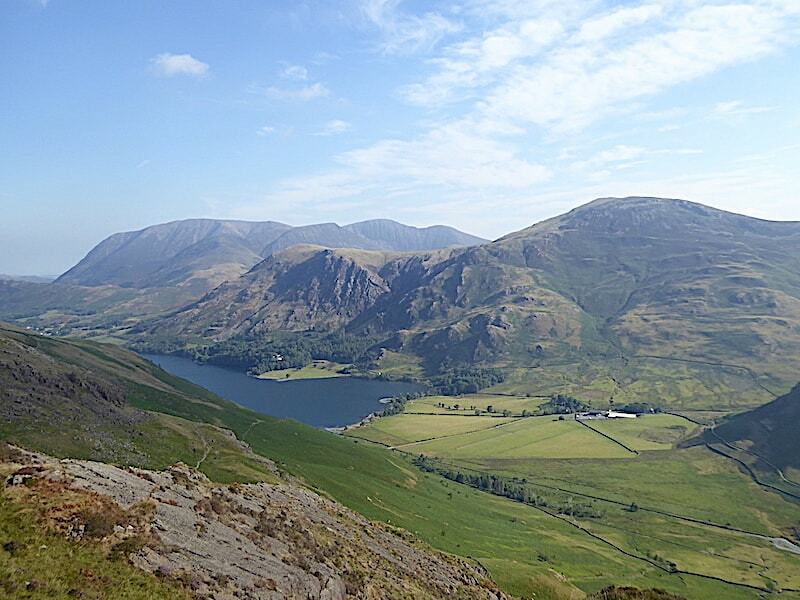 Its a climb requiring a long walk in along Ennerdale, all the appropriate climbing equipment, together with a climb leader who is experienced and well acquainted with the various routes which are to be found on it. 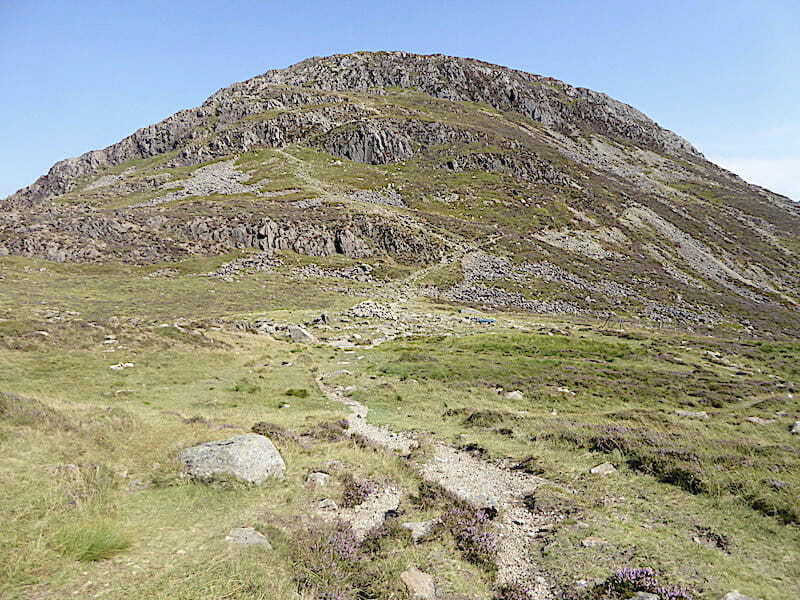 AW gives walkers the following advice – ‘To walkers whose experience is limited to easy scrambling on rough ground, Pillar Rock is positively out of bounds. Don’t even try to get a foothold on it. 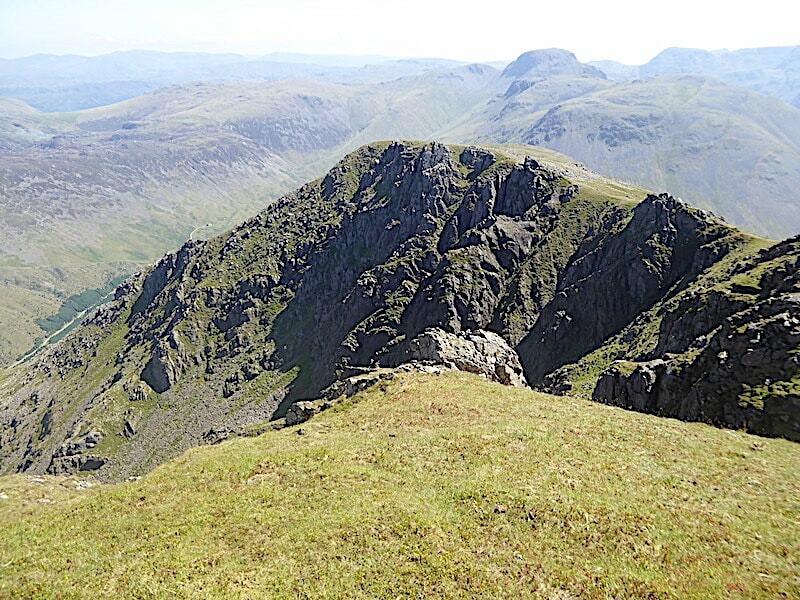 The climbing guides mention easy routes (The Old West and The Slab and Notch) but these are NOT easy for a walker who is not a climber, and lead into dangerous situations.’ He might also have added that its a very, very long drop should a fall occur. J takes a quick glance and carries on walking. 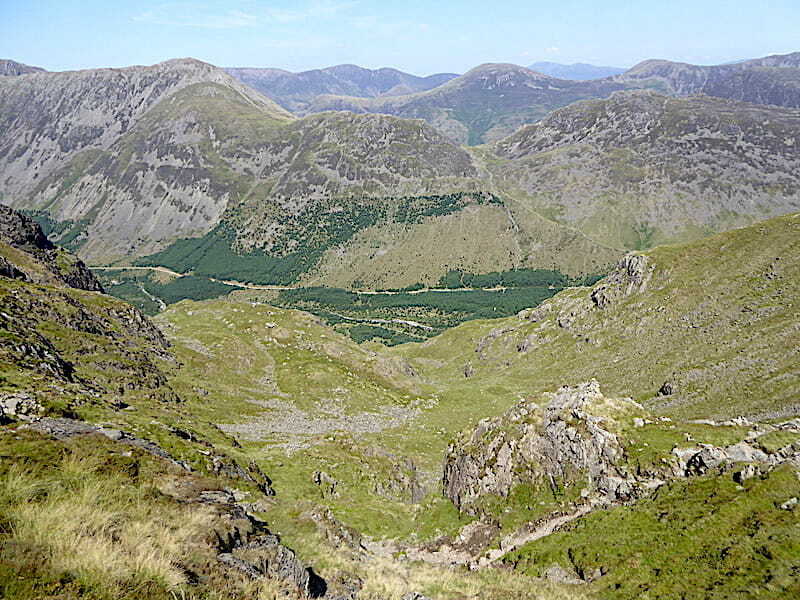 Four in a row way below us – first up is Haystacks immediately below us, then comes Fleetwith Pike followed by Dale Head with Clough Head bringing up the rear in the far distance. 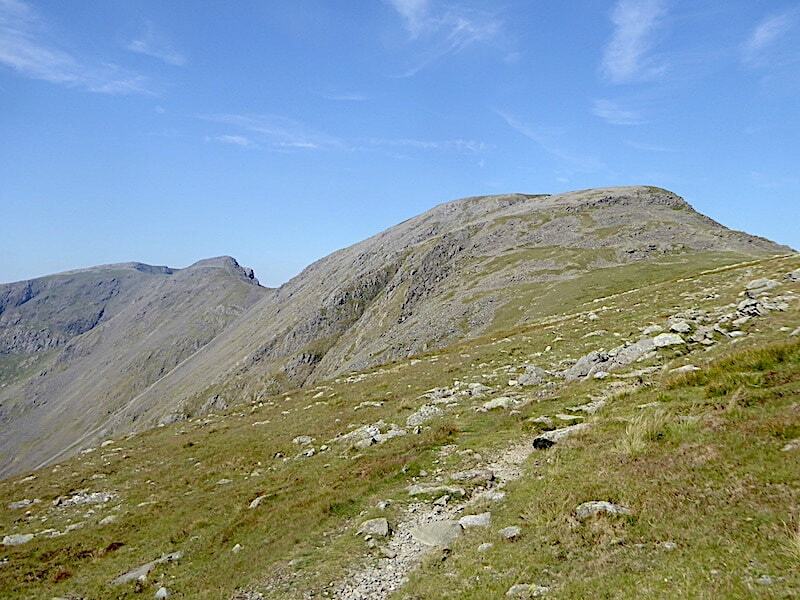 The two extras over on the right are Great Dodd and Stybarrow Dodd. 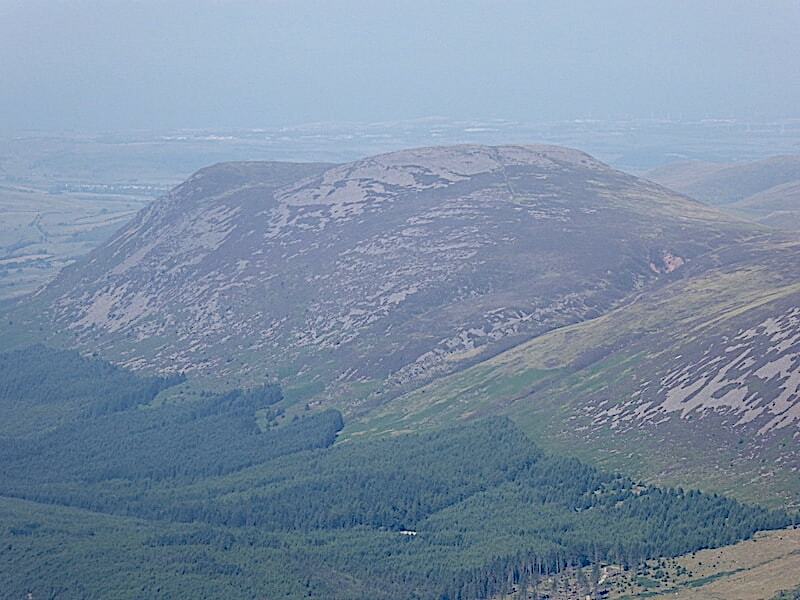 In the foreground High Crag swoops steeply down towards Seat, while across the centre Robinson descends gracefully over Littledale Edge towards Hindscarth. 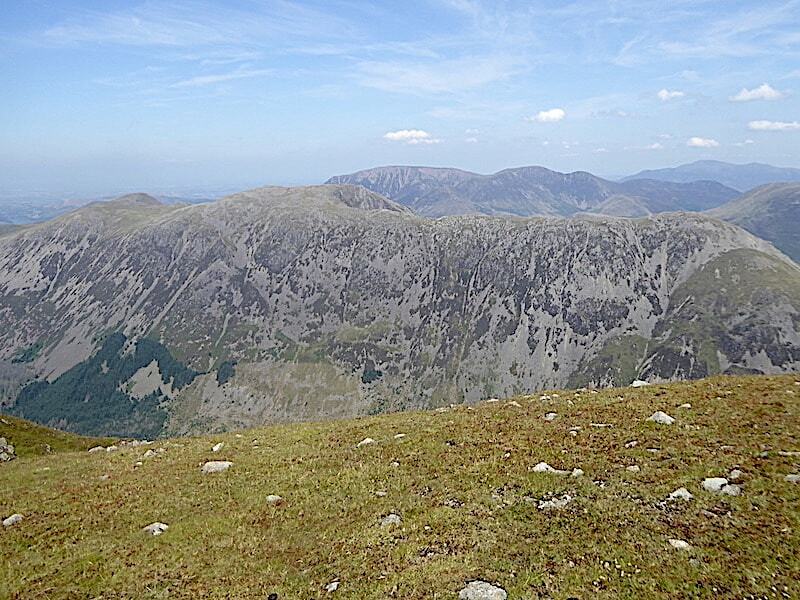 The heavyweights of Skiddaw and Blencathra are yet again occupying the outer limits of the skyline. 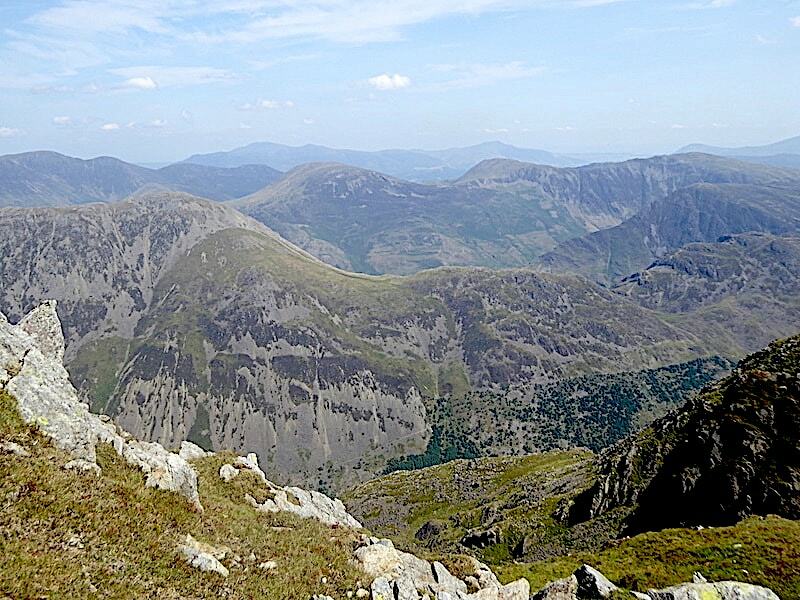 The fabulous views just keep on coming, Ennerdale below us with the vista extending right across to The Dodds and the Helvellyn range. I did mention that it was a long way down didn’t I? High on a hill stood a pair of walkers, yodel-odel-ayee-yodel-ay-ee-ee, simply entranced by the scene before them, yodel-odel-ayee-yodel-ay. I’ll probably be humming that for the next few days now. 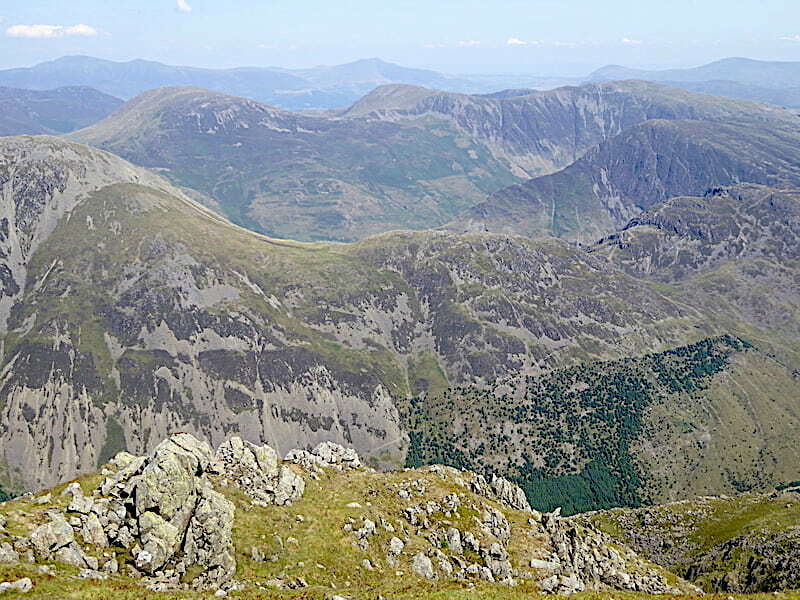 A zoom in across the High Stile ridge for a better view of Grasmoor over on the left, and Crag Hill and Sail to the right of centre. 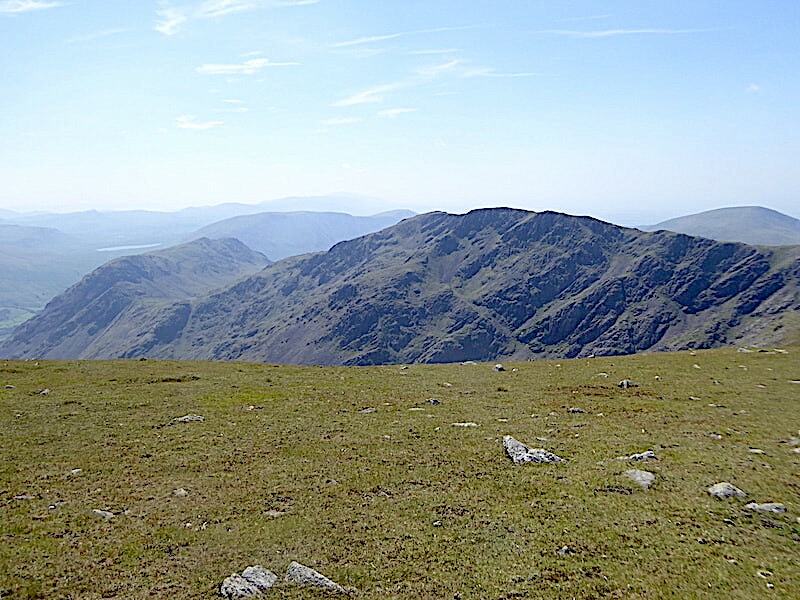 That just about completes our perambulation around the summit perimeter from where we have viewed the surrounding landscape across precipitous drops on every side of us. Time to begin making our way back down again. Gullies galore on the descent and I am now being urged not to go any further. This is such an enormous outcrop that it surely must have a name, though if it has I haven’t been able to discover it. Dropping down through the boulder strewn area of the third rise and ahead there’s a stretch of green and pleasant walking to enjoy. 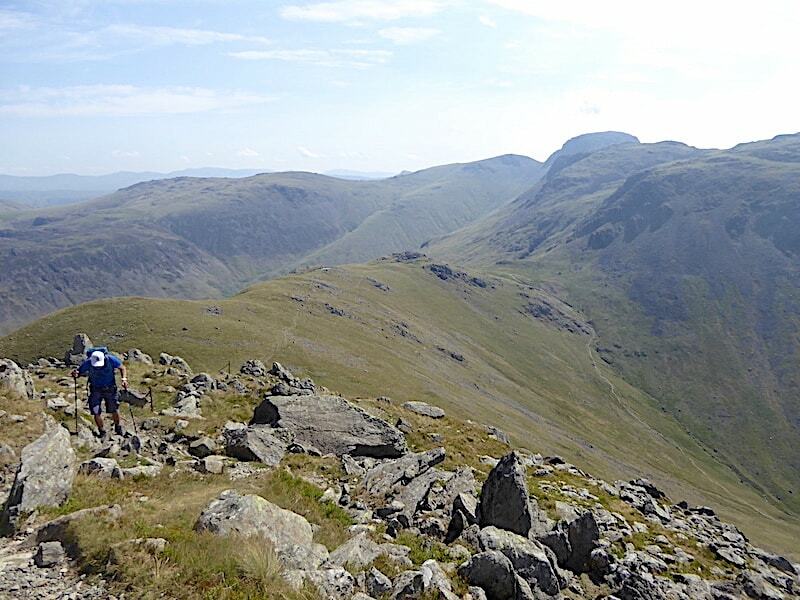 As we were making our way down two fell runners came by making light work of the stony ground and haring off at full pelt across the grassy shoulder. A zoom in might reveal one of them towards the end of the path. I know what would happen if we tried running down here. 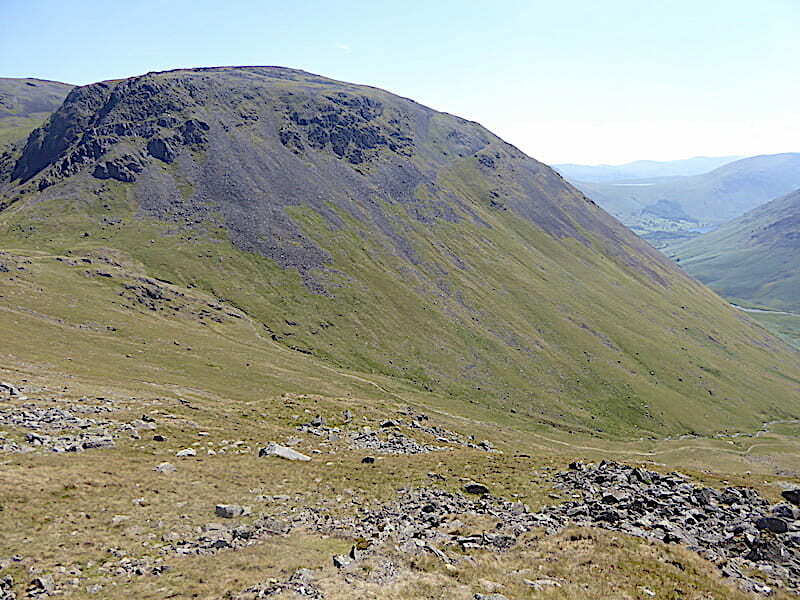 Another look along Mosedale where it seemed to be just a little clearer now. 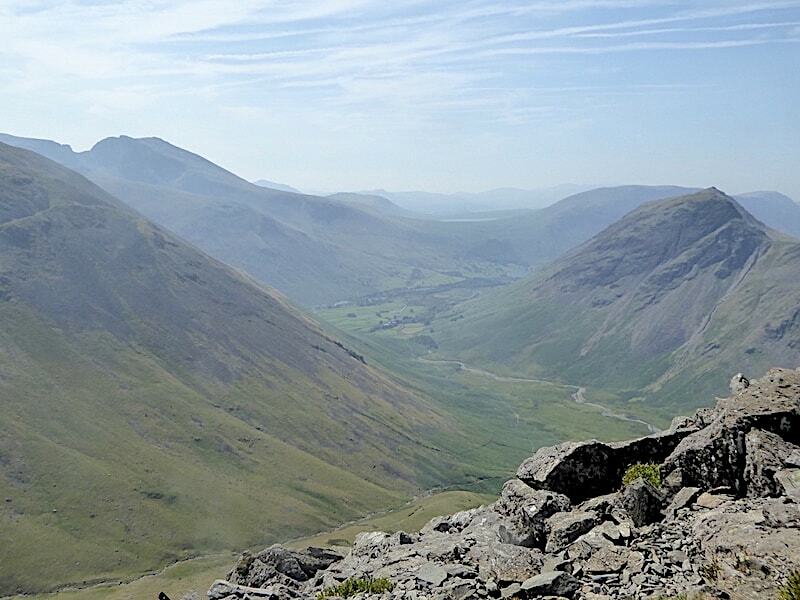 A closer look at Yewbarrow with just a hint of Wast Water on view. 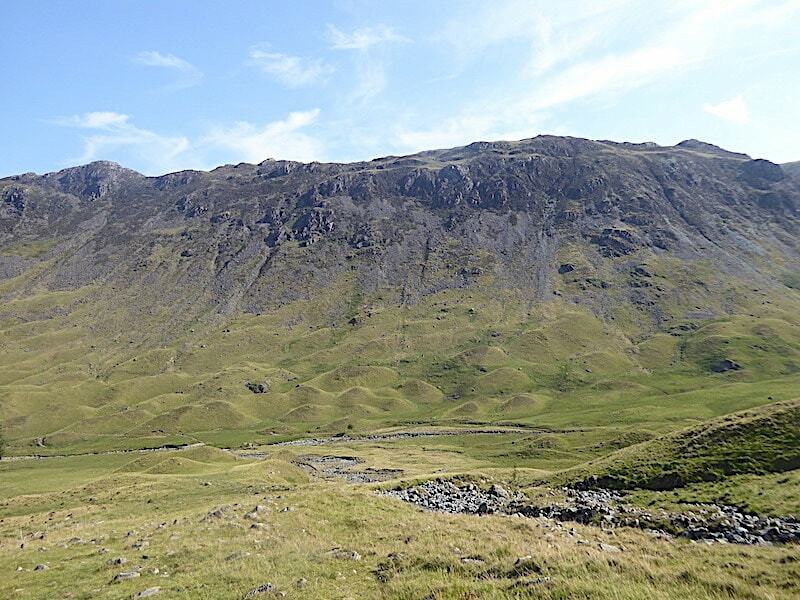 Wasdale’s Red Pike gradually being left behind. The stretch of green and pleasant walking comes to an abrupt end and it looks, and feels, as though we’re about to drop off the end of a cliff. Steady as we go then, skipper, and watch where you’re putting your feet. A steep descent which became even steeper when we reached the far end of it. 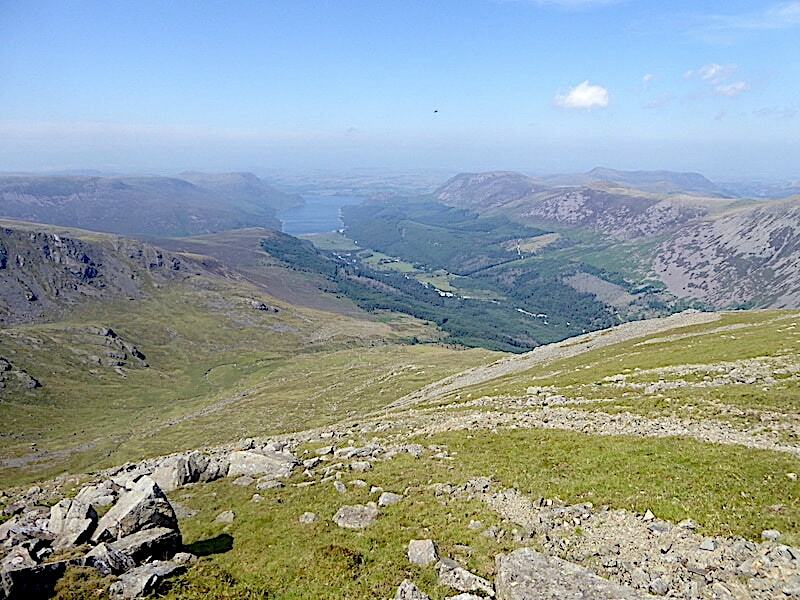 From the flatter, well worn area below we had a grandstand view …..
….. down into Green Cove and Ennerdale. The bouldery areas are finally behind us and we reach the comfort of the grassy shoulder and pass alongside Looking Stead once again. 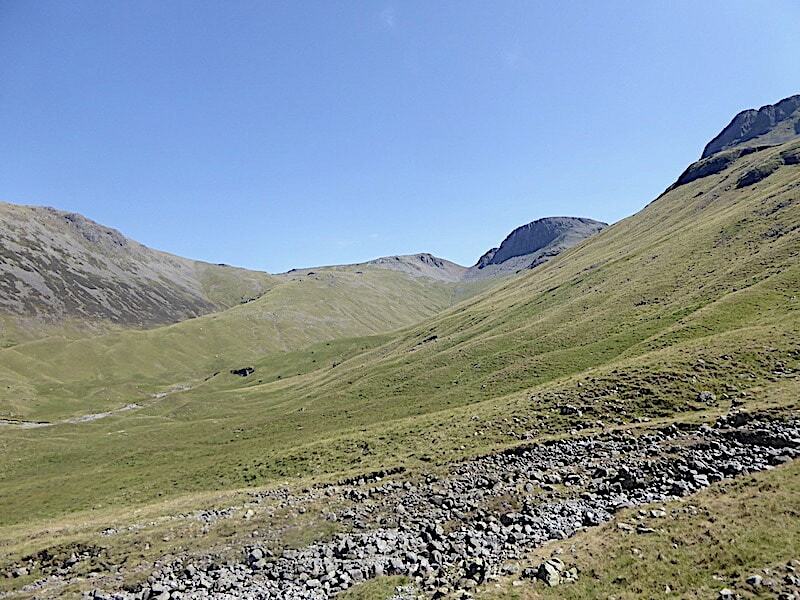 With all the rough walking behind us for the moment we make our way back to Black Sail Pass once again. 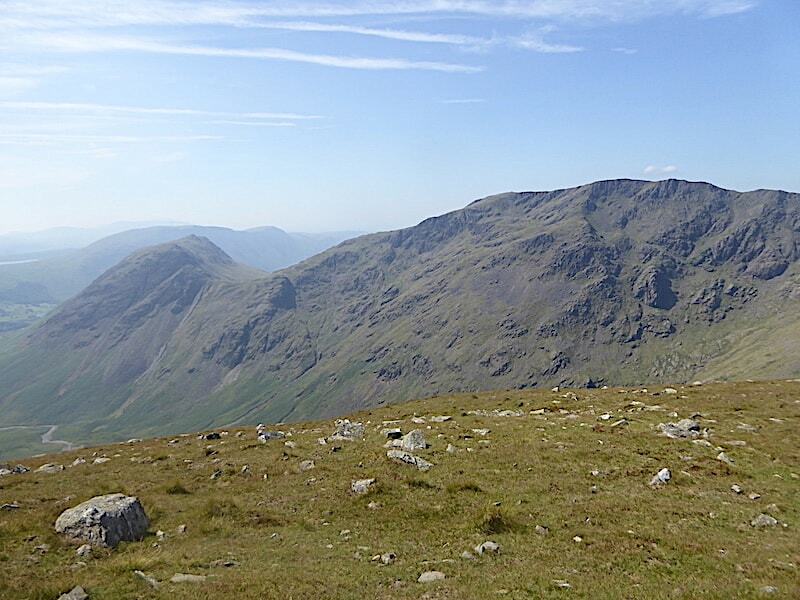 Kirk Fell now looking great deal clearer than it did earlier on. 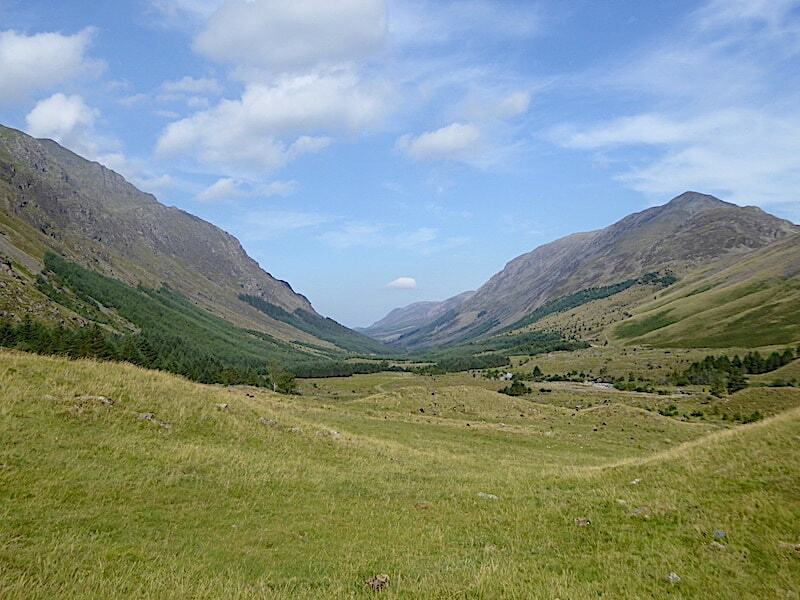 From the pass we join the Sail Beck path once again and descend into Ennerdale. Just before the tree there’s a short rock step to negotiate but there’s nothing at all difficult about it. 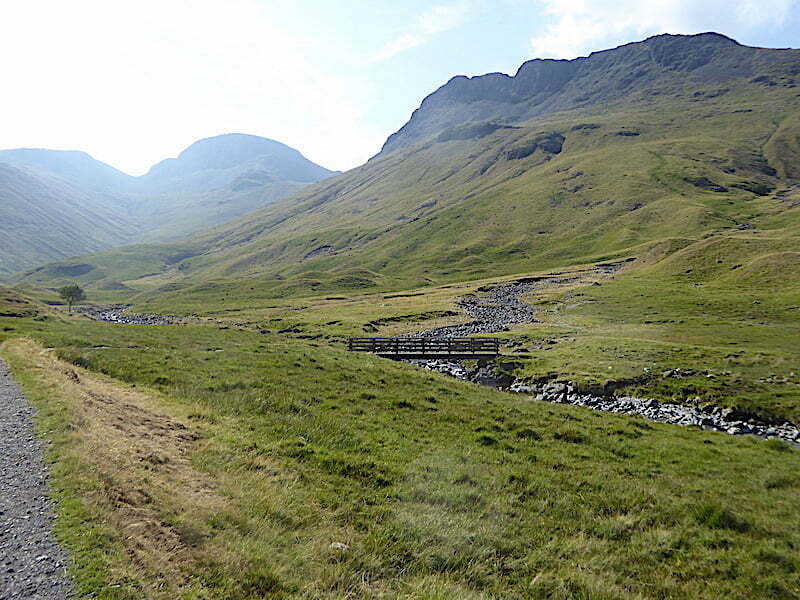 The hostel is back in view and so is the path rising up to Scarth Gap. There is no breeze down here in the valley, the heat is overpowering and my face mopping cloth gets a great deal more use than its had so far. 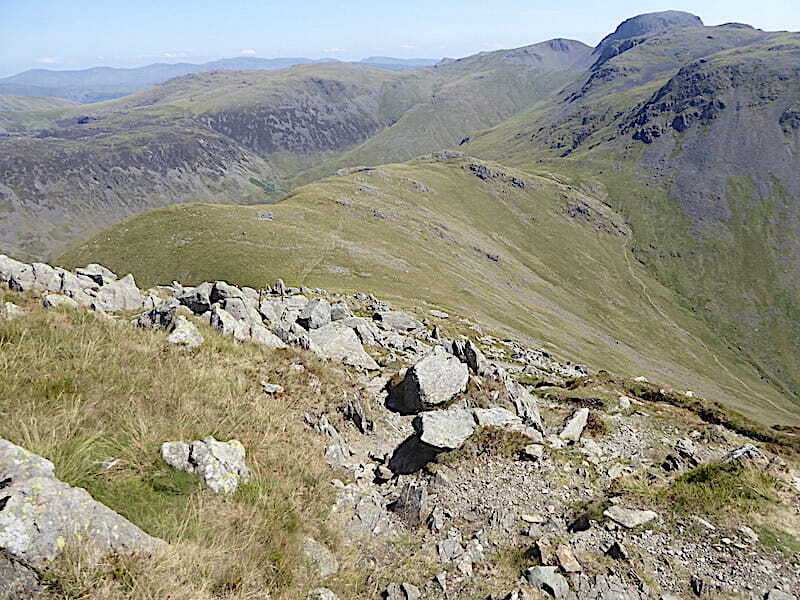 We get a slightly different view of Brandreth, Green Gable, Great Gable and Kirk Fell on the way down. 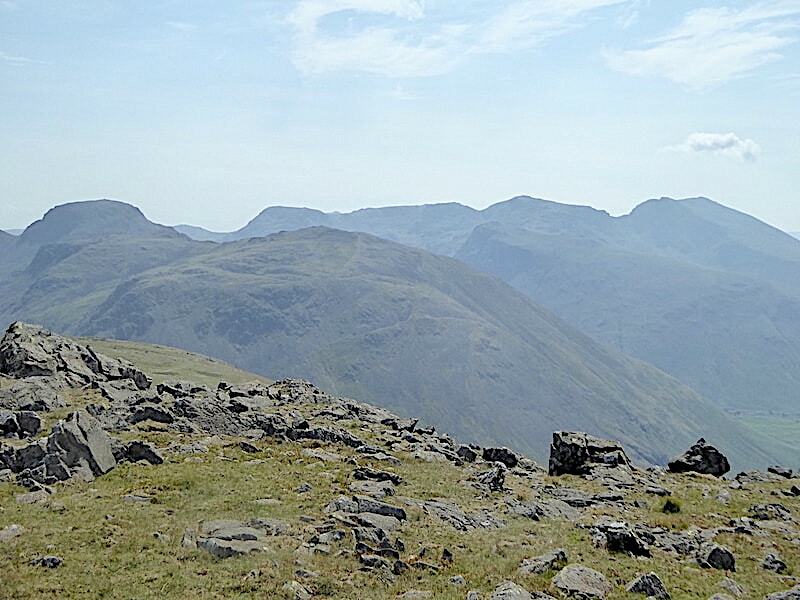 Windy Gap flanked by Green Gable and Great Gable. Back at the bridge over the Liza and a chance to empty the very warm water from our bottles, refill them with some much cooler river water and splash some over ourselves while we’re about it. Unfortunately we’ve reached the airless valley bottom around mid-afternoon just when the heat is at its most intense. 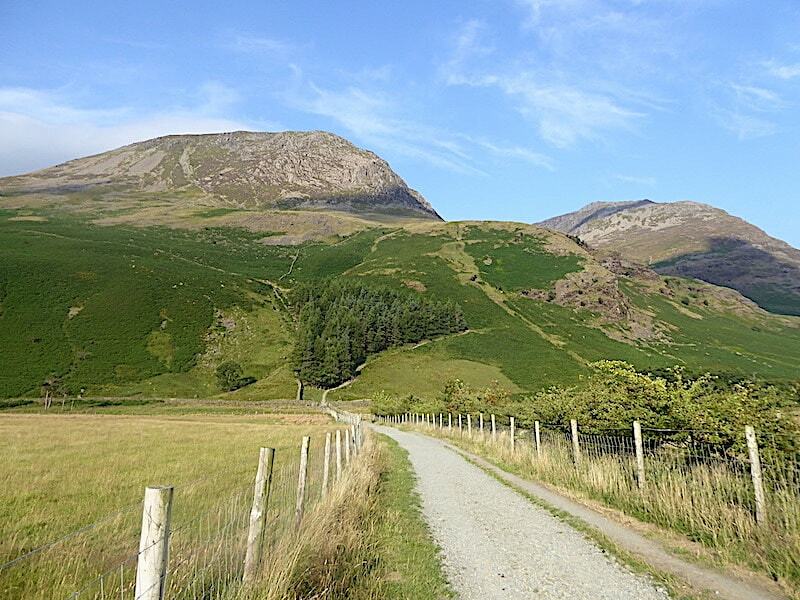 A look back along Ennerdale as we approach the hostel …..
….. and another view when we reach it. There’s no-one around at the hostel, the evening guests haven’t arrived yet. A notice invited visitors to make themselves cups of tea or coffee but that was the last thing we wanted. We had a quick look round and it looked to be comfortable enough for an overnight stay. The heat was intense now and we took a short break here. 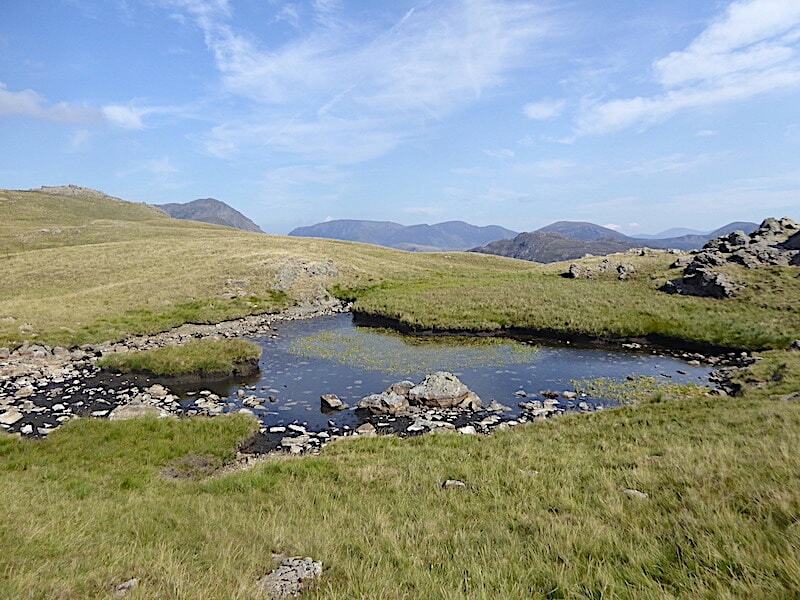 We drank plenty of water in readiness for the last climb of the day up to Scarth Gap and after ten minutes or so …..
….. we left the hostel and set off along the track up to the gate. We met several people along the way, one of whom has just come through the gate ahead and who asked us if she was on the right path for the hostel. I suppose all of them would be staying overnight in the hostel. Looking ahead I recalled that the gradient wasn’t excessive and that the stone steps up the path weren’t steeply pitched but, once we were on it, every step seemed to need more effort than all the other earlier climbs put together. On tiring legs and in sweltering heat this, of all the climbs we’d made today, was the most taxing and laborious despite its shortness. Tough it may have felt but at least we didn’t match AW’s description by crawling up on our hands and knees as the shadows of evening steal o’er the scene, so perhaps we fall into AW’s ‘strong walkers’ category after all. 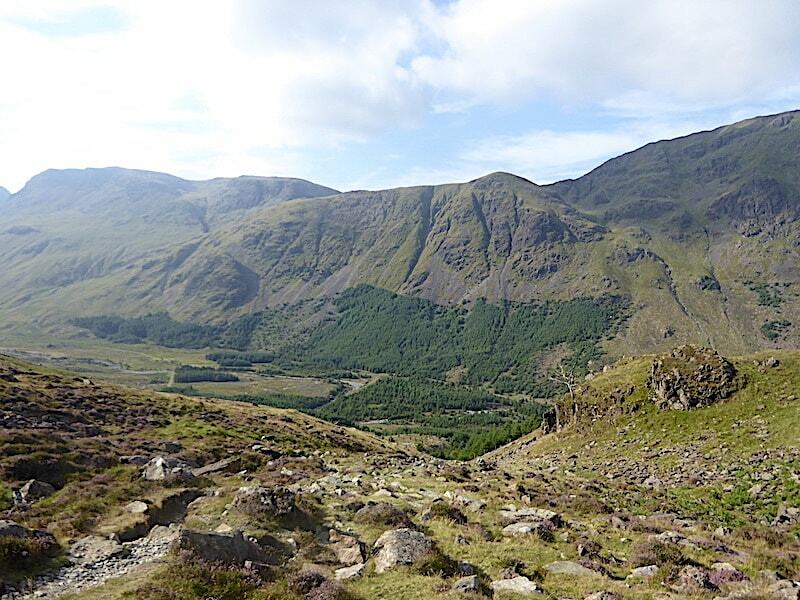 When we reached Scarth Gap we flopped onto a couple of handy boulders and wrapped ourselves around a couple of juicy tangerines, thankful that it was all downhill for the rest of the walk. Our tangerine stop view looking back to Haystacks. Refreshed and rested we begin the last bite-sized chunk of the day, down the Scarth Gap path back down to Gatesgarth and enjoying the familiar view of Fleetwith Pike across Warnscale Bottom. 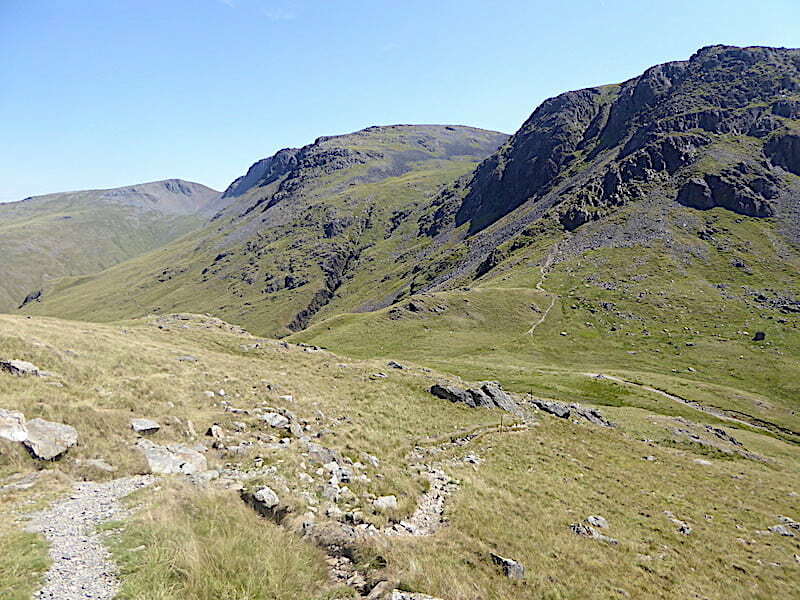 The path was busy with walkers, mostly holidaymakers by their appearance, going up to, or coming down from, Haystacks. 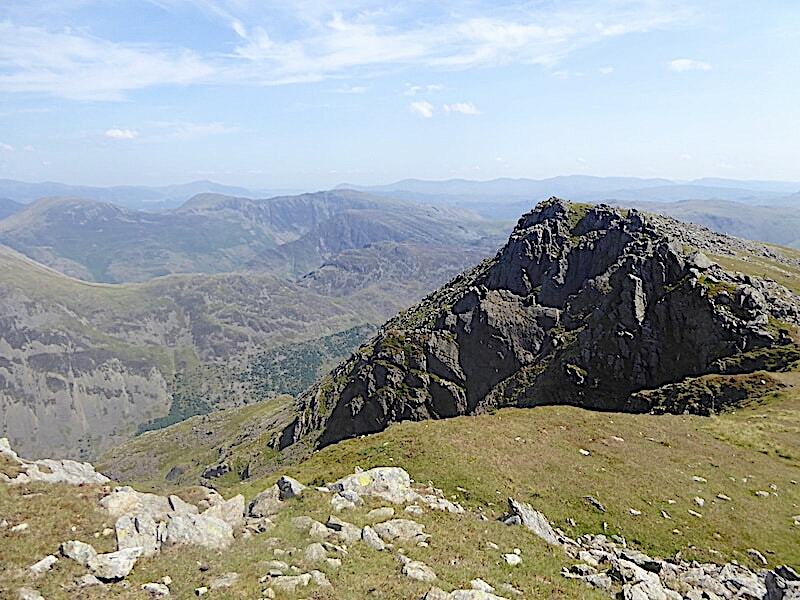 A look back up towards Haystacks …..
….. and another one from much further down the path. 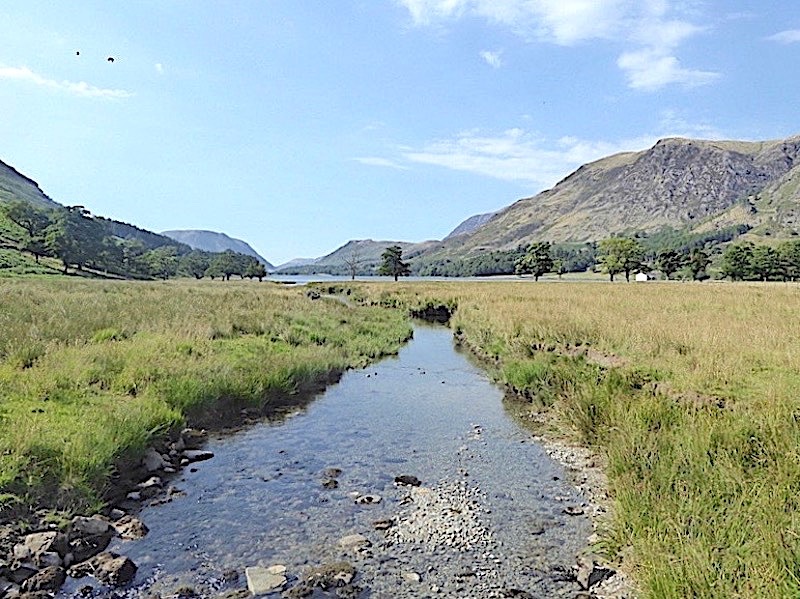 Buttermere and Gatesgarth Farm come back into view …..
….. and almost before we know it we are back at Peggy’s Bridge and on our way across Warnscale Bottom back to the car. The refreshment van at the farm was open and doing a brisk trade so we joined the queue and treated ourselves to a large vanilla cornet, with the obligatory chocolate flake bar of course, and never has an ice-cream tasted so good. 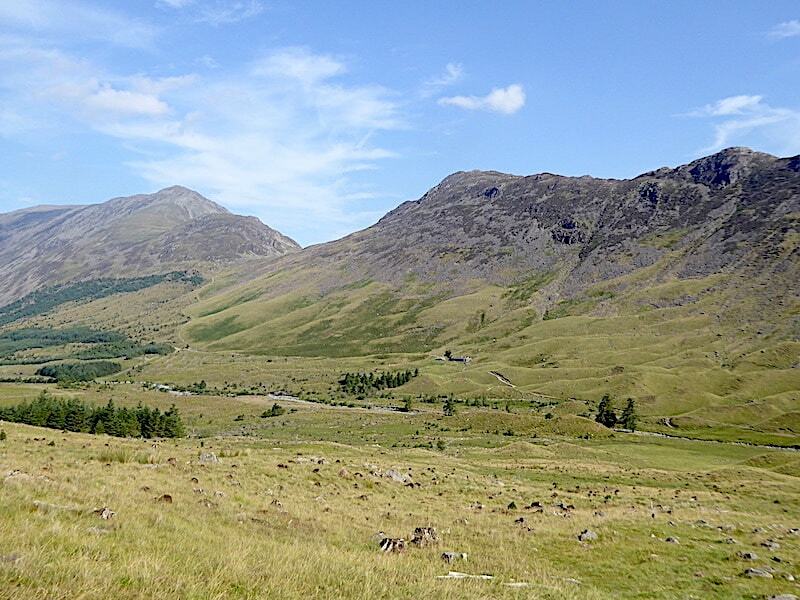 We wander back to the car, lift the tailgate, hoy the packs inside, finish our ice-creams whilst leaning against the boot, enjoy the cooling shade of a nearby tree and look back, with a certain degree of satisfaction, on a fabulous and thoroughly enjoyable day’s walking. A grand day out, as Wallace would say.